LeBron James and Kyrie Irving made history in the Cleveland Cavaliers’ NBA Finals-saving Game 5 win at the Golden State Warriors. OAKLAND, Calif. — The boos, baby bottles and lingering bitterness were no match for LeBron James, who, one loss from another maddening Finals failure and in the middle of a firestorm, turned in one of the most sensational postseason performances of his career. There was, it turned out, only one adequate match for James’s brilliance: Kyrie Irving. Together, the two All-Stars relished their roles as party-crashers and parade-postponers on Monday, leading the Cavaliers to a 112–97 Game 5 victory over the Warriors that extends the series to a Game 6 in Cleveland on Thursday. Seizing on the hope generated by the NBA’s suspension of Draymond Green, this odd couple—the 31-year-old pass-first forward and the 24-year-old shoot-first point guard—took turns torching the Warriors in unprecedented fashion. By night’s end, James and Irving had scored 41 points each, becoming the first pair of teammates to top 40 points in the same game in Finals history. This wasn’t a case of brute force offense, but rather of two elite scorers simultaneously finding a sweet, unstoppable groove. With Kevin Love lost in space and Cleveland’s second-unit struggling to contribute again, James and Irving kept pouring it on and pouring it on, finding a seamlessness that has been elusive during their two seasons together. James, who scored 25 points in the first half, finished with 16 rebounds, seven assists, three blocks and three steals, giving him a stat line that hasn’t been matched since at least 1984. He levitated for powerful chasedown blocks, powered through Golden State’s shorthanded defense and even coaxed some dependability out of his on-again, off-again jumper just one game after it deserted him in crunch time. James played with exceptional focus and purpose after three days of bad blood with the Warriors over Green’s low blow, his public criticism of Green’s play and in-game profanity and Klay Thompson’s suggestion that James had his “feelings hurt.” Green’s absence was a gamechanger and James knew it, as he repeatedly attacked the heart of Golden State’s small lineups and played as if he had a mute button for the endless boos from hecklers who condemned him for his alleged whining after Game 4. Considering the stakes and the statistical output, James’s Game 5 deserves a spot alongside his best playoff moments: 2013 Finals Game 7, 2012 East finals Game 6, 2008 East semis Game 7, 2007 East finals Game 5 and his one-man army games from last year’s Finals. What was different this time, though, was that he legitimately shared top billing. “It’s probably one of the greatest performances I’ve ever seen live,” James said, in reference to Irving’s play, not his own. Irving, whose Game 4 also ended in shaky fashion, was lava in response. He finished 17-of-24 from the field, finding points from everywhere and smashed his previous postseason-high of 34 points (set one game earlier.) He, like James, took advantage of Green’s absence and of a knee sprain that sidelined Andrew Bogut in the second half to put on a clinic, finding a new confidence and freedom as he went downhill against Golden State. The 2011 No. 1 pick spent virtually the entire second half in the zone, finishing contorting layups, draining pull-up jumpers with a hand in his face, hitting step-back turnarounds in the paint, and knocking down catch-and-shoot threes. Irving only picked up steam as the game went deeper and deeper, scoring 12 points in the fourth quarter. He outshot and outplayed Stephen Curry so badly that the home crowd began flooding out of Oracle Arena with more than two minutes remaining in the game. LeBron James holds up the shiny gold trophy in what might be his sweetest championship yet, the one he is so proudly bringing home to his native northeast Ohio just as he promised to do when he returned to the Cavaliers two summers earlier. LeBron James loses the ball as he tries to fend off Andre Iguodala in Game 1 between the Warriors and Cavaliers. Golden State won the game and the series 4-2. Iguodala became the first player to win the Finals MVP award without having started every game in the series. 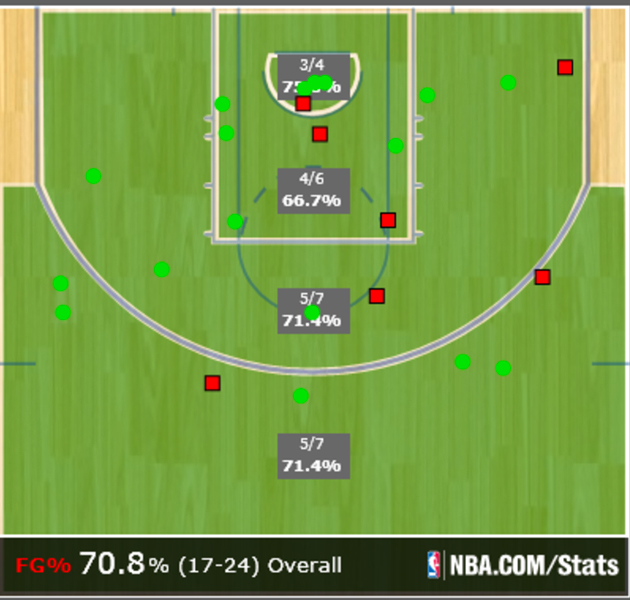 He was tasked with guarding LeBron, who made only 38.1 percent of his shots when Iguodala was in the game. Steph Curry goes to the left hand against J.R. Smith to score two of his 25 points in Game 6. The Warriors defeated the Cavs 105-97 to clinch the franchise's first NBA title since 1975. A year after an excruciating loss to the Miami Heat in the NBA Finals, Tim Duncan and the Spurs got their revenge, winning the title in five games. 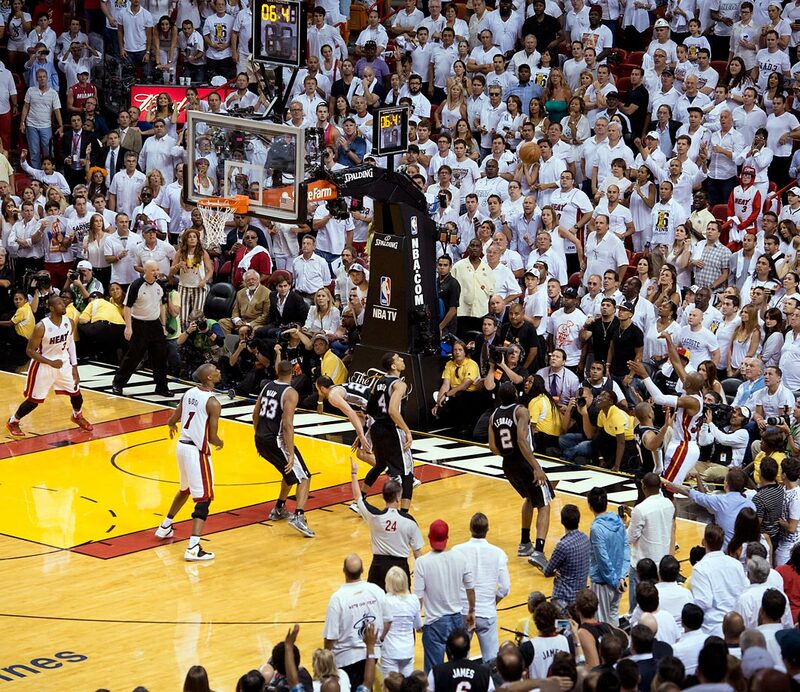 Ray Allen lets loose a series-changing three over Tony Parker in Game 6. With Miami down 3-2 in the series, it was the veteran Allen who sent the game to overtime and an eventual Heat victory. With a huge momentum boost, Miami went on to win the series. LeBron James led Miami to the finals for a third straight year and to a second consecutive title, duking it out with the Spurs for seven games. James won his second Finals MVP award with another series of stellar showings. 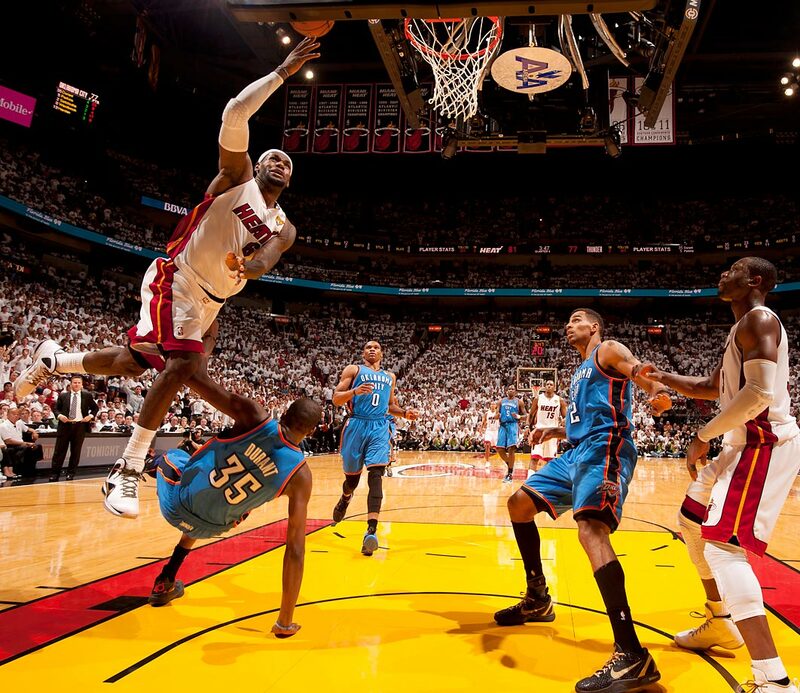 LeBron James soars over Kevin Durant in Game 3. James got the championship monkey off his back in a big way, averaging 28.6 points, 10.2 rebounds and 7.4 assists in the series. 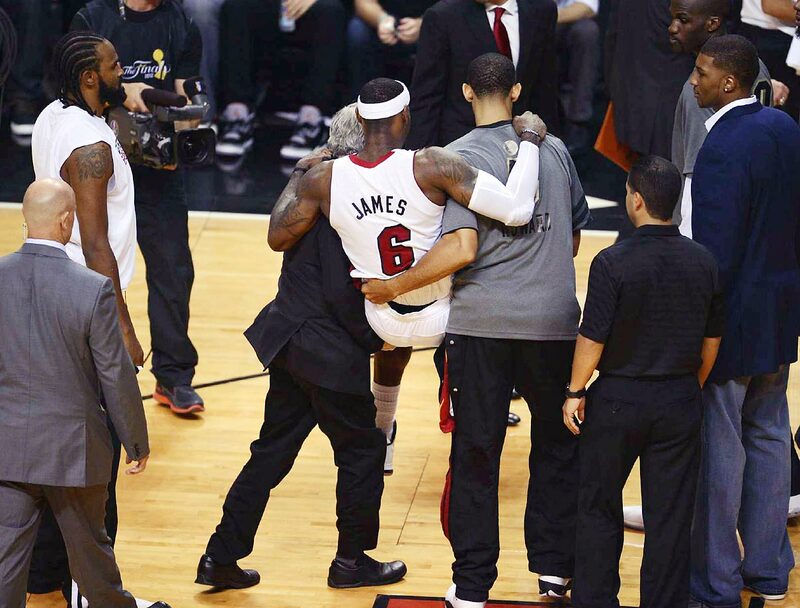 LeBron James battled cramps in Game 4 and was unable to finish out a 104-98 Heat victory. He still had 26 points, nine rebounds and 12 assists. Dirk Nowitzki avoids traffic to drop in the game-winner for Dallas in Game 2. Nowitzki's clutch shot capped a furious 15-point fourth-quarter Mavs comeback. Dallas would knock off favored Miami and the "Big Three" of LeBron James, Dwyane Wade and Chris Bosh in six games in a rematch of the 2006 Finals. 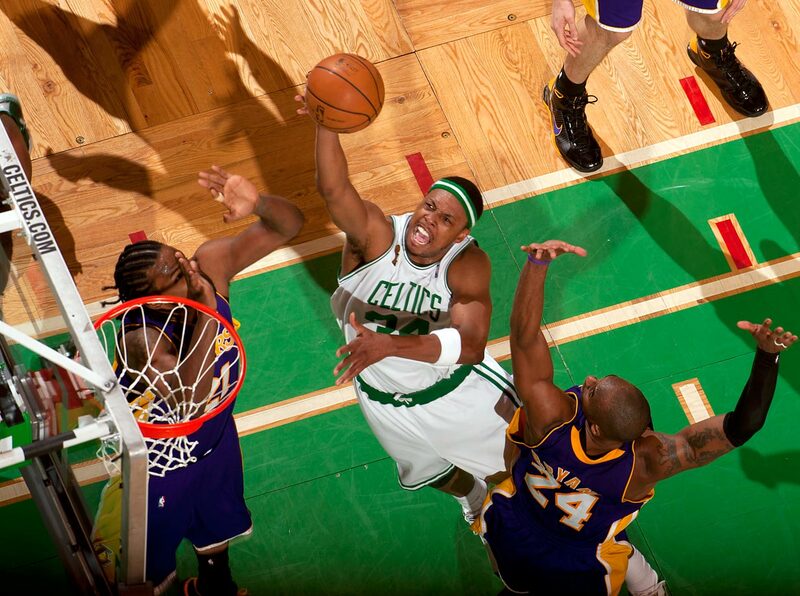 Kobe Bryant looks to shoot over Rajon Rondo in Game 6 between the Lakers and Celtics. Kobe averaged 29 points per game in the series, en route to his second consecutive Finals MVP award. 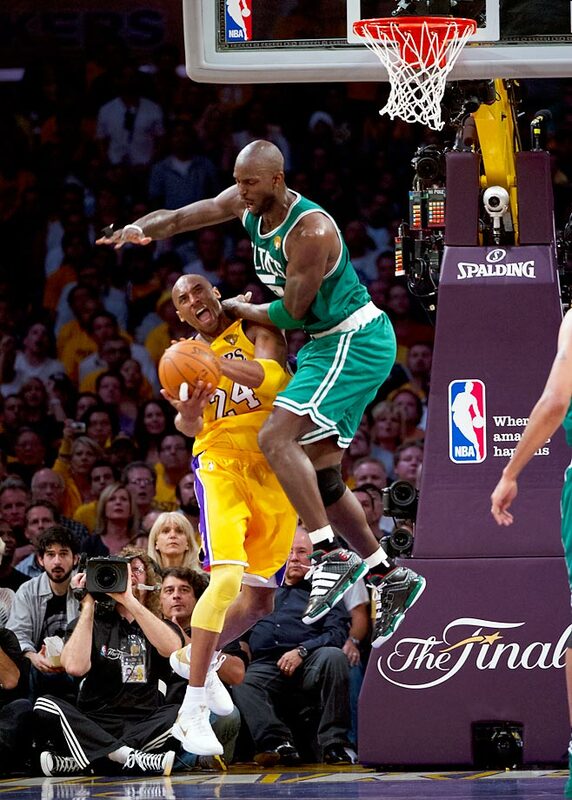 Kevin Garnett bodies a driving Kobe Bryant in a tight Game 7. The Celtics-Lakers rivalry was renewed in a back-and-forth series that saw Los Angeles come out on top for a second straight title. 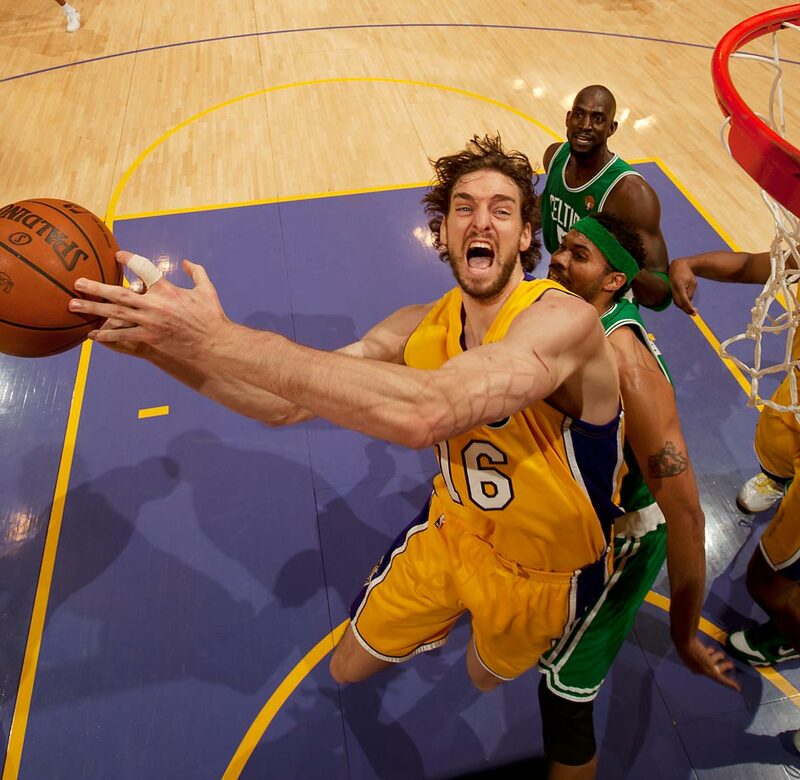 Pau Gasol owned the paint in Game 7 with 19 points and 18 rebounds to push the Lakers to an 83-79 win. Pau Gasol hugs Kobe Bryant near the end of a series-clinching Game 5. The duo was crucial to L.A.'s five-game victory over Orlando, with Bryant named Finals MVP and winning his first title out of Shaquille O'Neal's shadow. Averaging nearly 22 points per game, Finals MVP Paul Pierce paired with offseason acquisitions Kevin Garnett and Ray Allen to return the Celtics to their championship ways against the rival Lakers. The win marked the first title for each of the three stars. San Antonio's Tony Parker was named Most Valuable Player of the series, averaging 24.5 points per game in the sweep. Tim Duncan and the Spurs spoiled LeBron James' first Finals, limiting him to 35.6% shooting and efficiently sweeping the series. Dwyane Wade, at just 24 years old, catalyzed the Heat past Dallas in six, memorably scoring 42 points and leading a comeback from a 13-point deficit with six minutes left in Game 3. The series marked Wade's arrival as a superstar, as he averaged nearly 35 points and eight rebounds per game to lead Miami to its first title. Ben Wallace and Manu Ginobili battle for a loose ball in Game 5 between the Pistons and Spurs. The past two NBA champs traded blows in a tough series that went seven games, with San Antonio coming out on top. 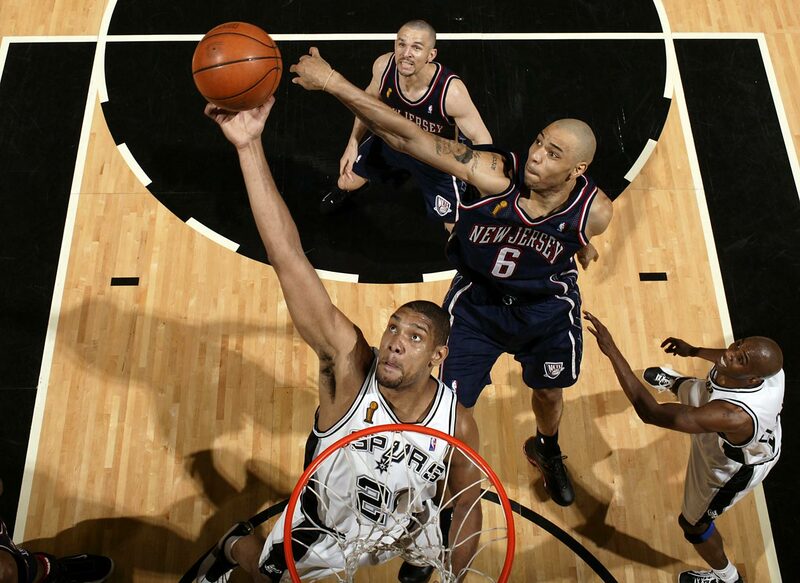 Robert Horry, better known as "Big Shot Rob," buries the three to win Game 5 for San Antonio. 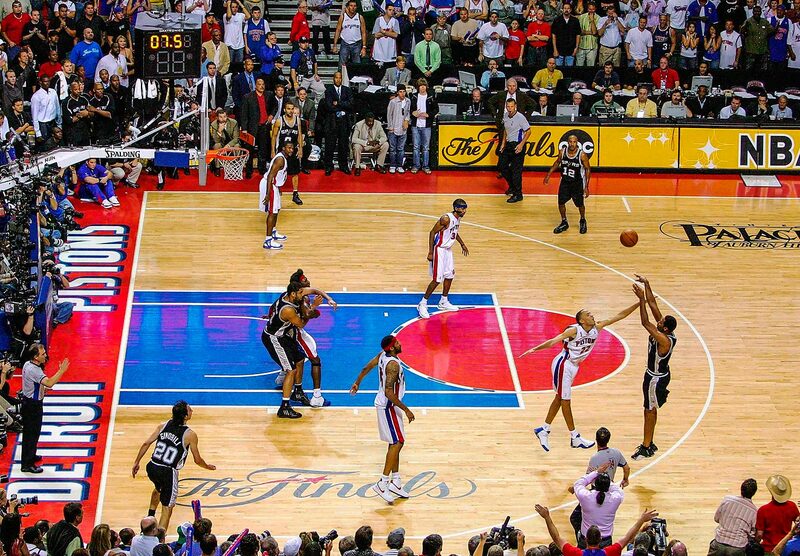 Tim Duncan drives to basket against Rasheed Wallace in Game 7 between the Spurs and Pistons. 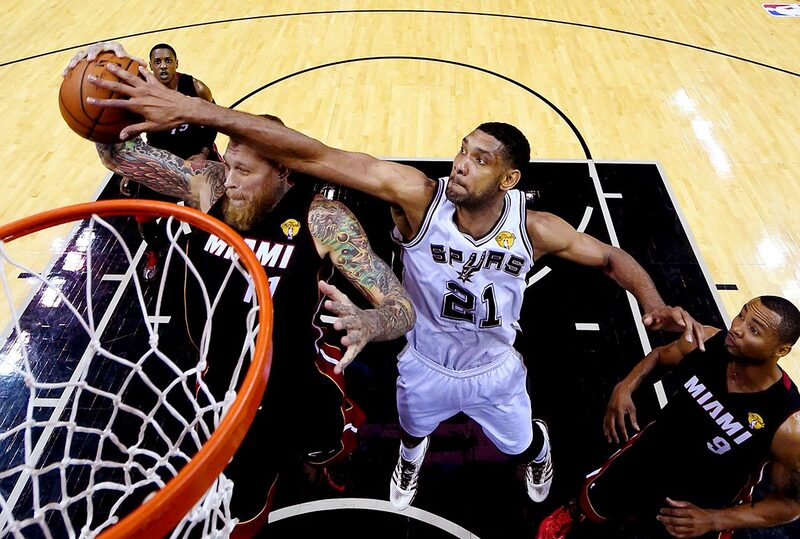 Duncan scored a game-high 25 points and 11 rebounds as he led San Antonio to their third title and won his third Finals MVP award. 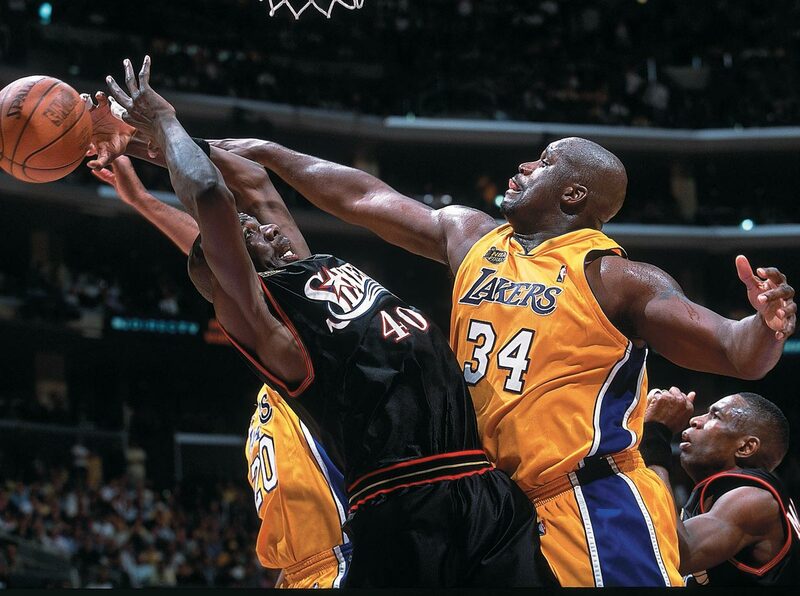 Shaquille O'Neal of the Lakers and Rasheed Wallace of the Pistons grapple for a rebound. 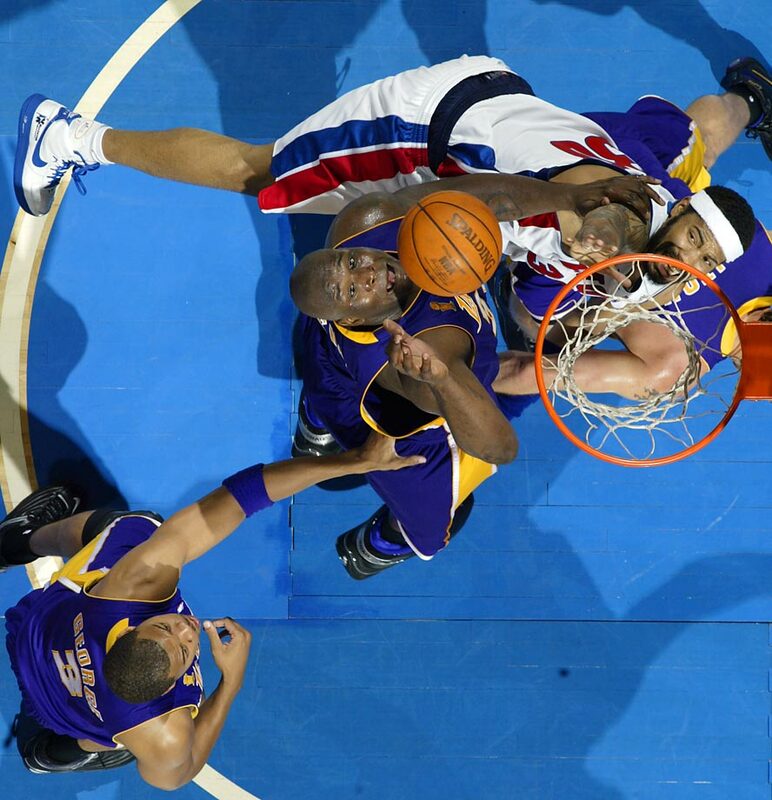 Detroit impressively dispatched L.A.'s O'Neal-Kobe Bryant tandem in five games. 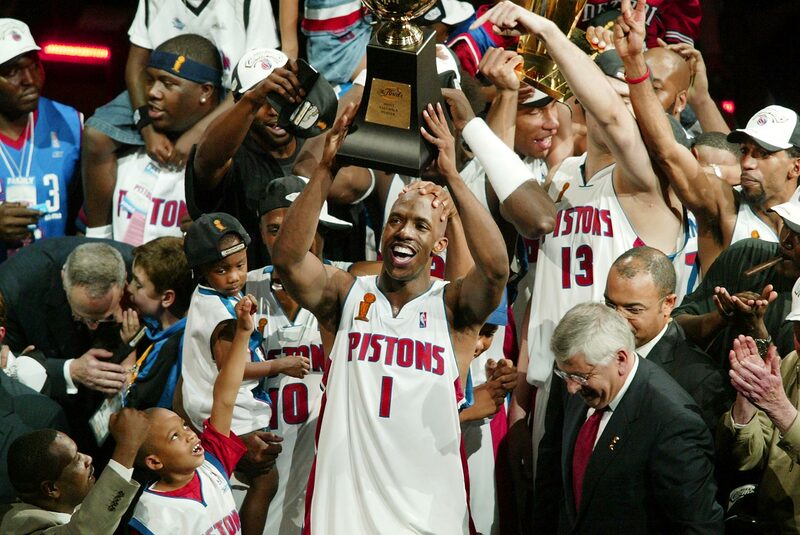 Chauncey Billups hoists the trophy as the Pistons celebrate their championship. With a penchant for making shots in critical moments, Billups was named Finals MVP. 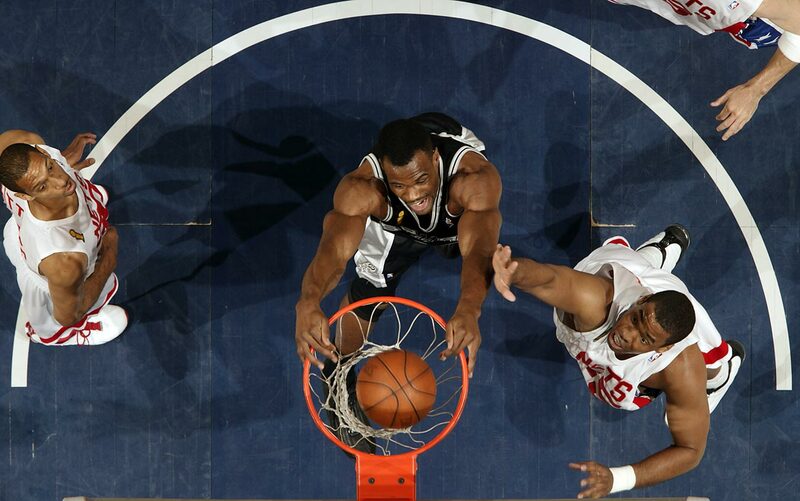 David Robinson of the Spurs dunks on Jason Collins of the Nets in Game 5. San Antonio took the series in six games, with Robinson teaming up with the core of Tim Duncan, Tony Parker and Manu Ginobili winning their first title together. Finals MVP Tim Duncan came up huge for San Antonio in the Game 6 series-clincher with 21 points, 20 boards, 10 assists and eight blocks. Shaquille O'Neal and the Lakers blew away the Jason Kidd-led Nets in a four-game sweep. O'Neal averaged more than 36 points per game as L.A. took home a third straight title. 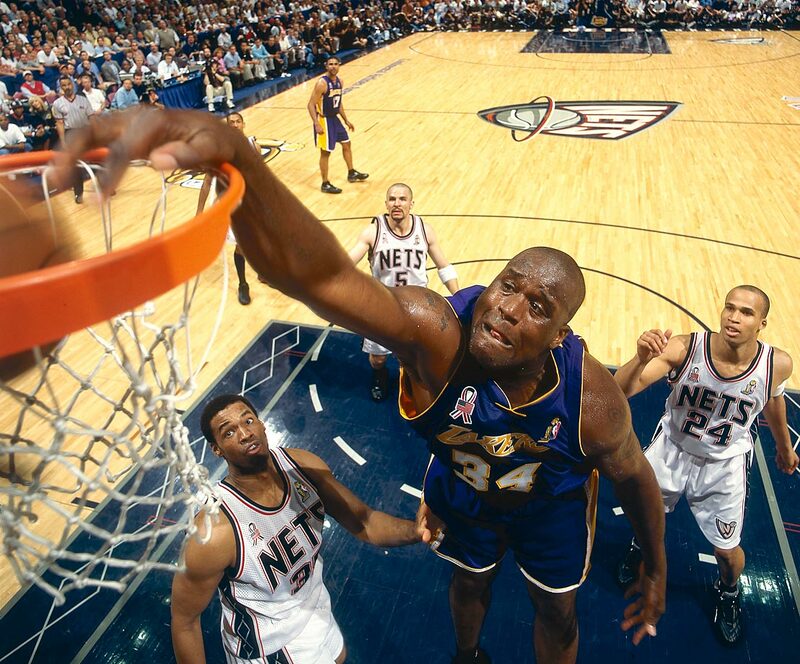 Shaquille O'Neal was simply too much for Philadelphia to handle in the series, winning his second straight Finals MVP honors and contributing a near quadruple-double in Game 2 with 28 points, 20 rebounds, nine assists and eight blocks. Kobe Bryant of the Lakers avoids 76ers center Dikembe Mutombo in Game 4. Though still overshadowed by Shaquille O'Neal, the 22-year-old Bryant continued to shine in his own right, averaging nearly 25 points for the series. 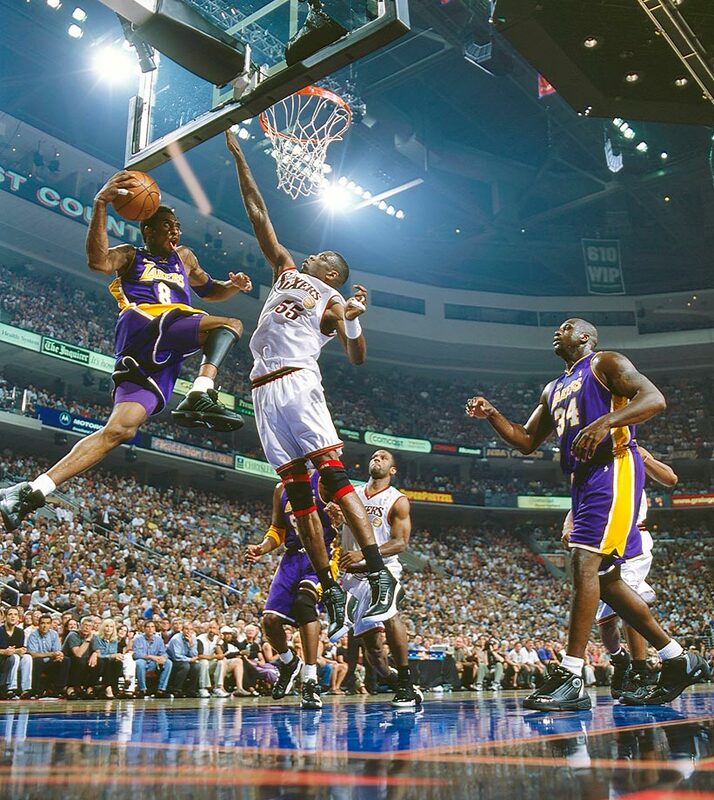 Sixers guard Allen Iverson dribbles the ball against Tyronn Lue of the Lakers during Game 1. Bolstered by the dynamic Iverson's 48 points, Philadelphia pulled off an upset, 107-101. 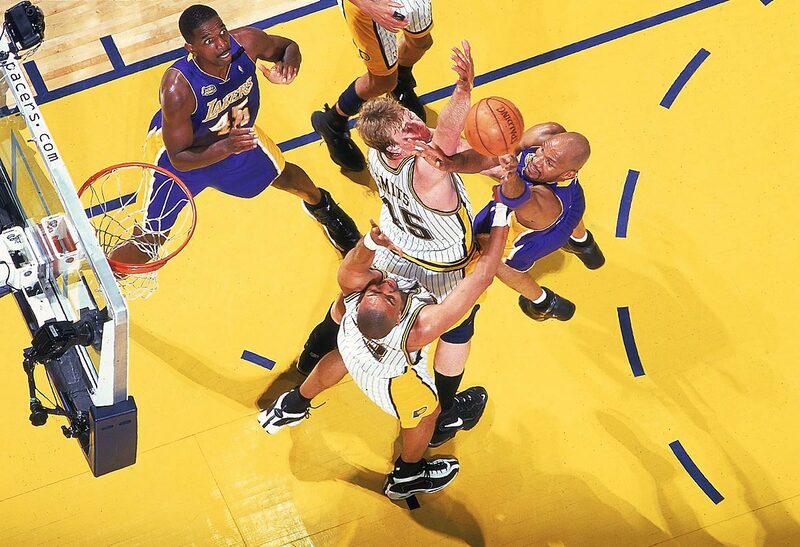 Ron Harper of the Lakers shoots over Pacers center Rik Smits in Game 4. Reggie Miller averaged more than 24 points per game, but couldn't shoot Indiana past Shaq and the Lakers in what would be the only Finals appearance of his career. Kobe Bryant drives to the basket against Dale Davis and Reggie Miller in Game 6 between the Lakers and Pacers. Shaq and Kobe celebrate after winning Game 6 against the Pacers for the championship. 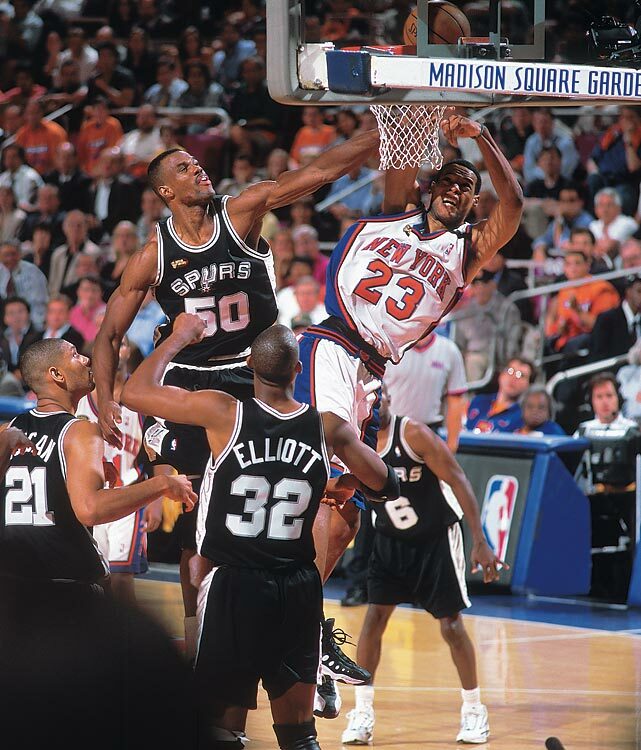 Spurs center David Robinson blocks Marcus Camby of the Knicks in Game 4. San Antonio, led by Robinson and a young Tim Duncan, took up the mantle post-Jordan and defeated the Knicks in five games for its first title. 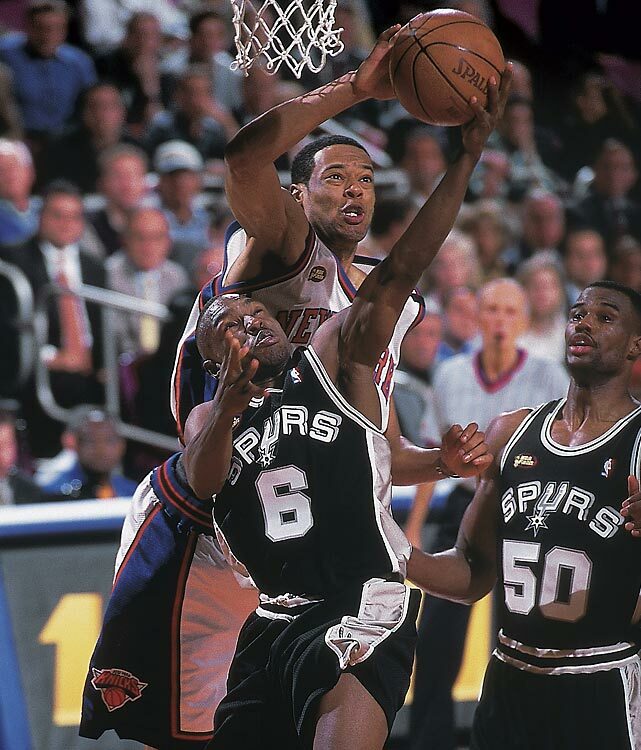 Marcus Camby of the Knicks blocks Spurs guard Avery Johnson in Game 3. Johnson would have the last laugh, hitting a last-minute shot to close out New York in Game 5. Michael Jordan drains the game-winning jumper over Bryon Russell of the Utah Jazz in Game 6. It would be MJ's last shot as a Bull, but not his last in the NBA — he unretired, of course, in 2001. Karl Malone of the Jazz dunks over Dennis Rodman and Ron Harper of the Bulls in Game 1. Malone and point guard John Stockton posed a challenge to the Bulls with their efficiency, but Michael Jordan and company found ways to win yet again. Game 5, which came to be known as "The Flu Game," saw Michael Jordan compete through severe illness to come up big for Chicago. Jordan brought the Bulls back from a 16-point deficit, improbably scoring 38 points in a 90-88 win after spending much of the past 24 hours confined to his hotel bed. At the end of the game, Jordan collapsed into Scottie Pippen's arms in what became an iconic moment. 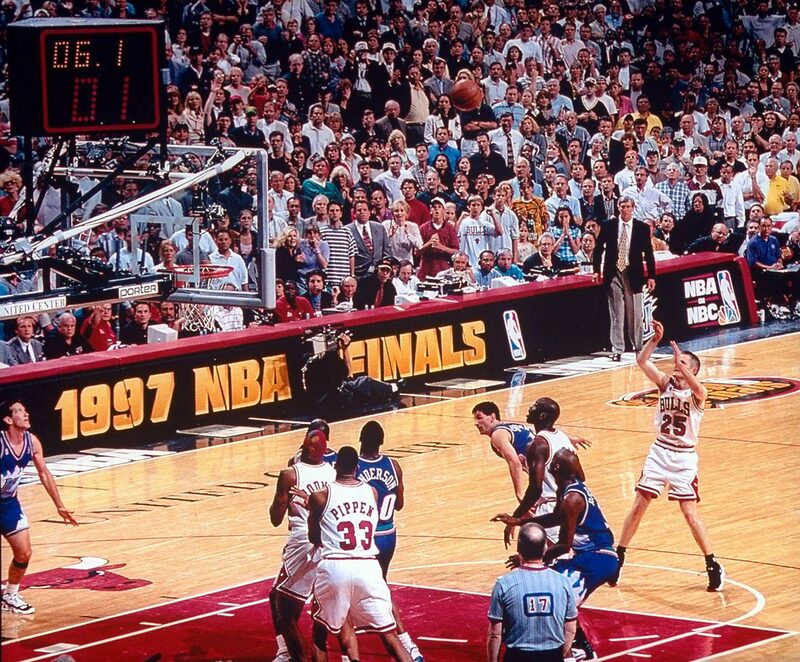 In Game 6, it wasn't Jordan or Pippen (though they combined for 62 points) but rather Bulls guard Steve Kerr who sealed Chicago's fifth title, with a 17-footer. Dennis Rodman grabs a rebound against the Sonics in Game 1. Rodman averaged nearly 14 boards per game in the playoffs for the Bulls, who acquired the power forward from San Antonio before the season. 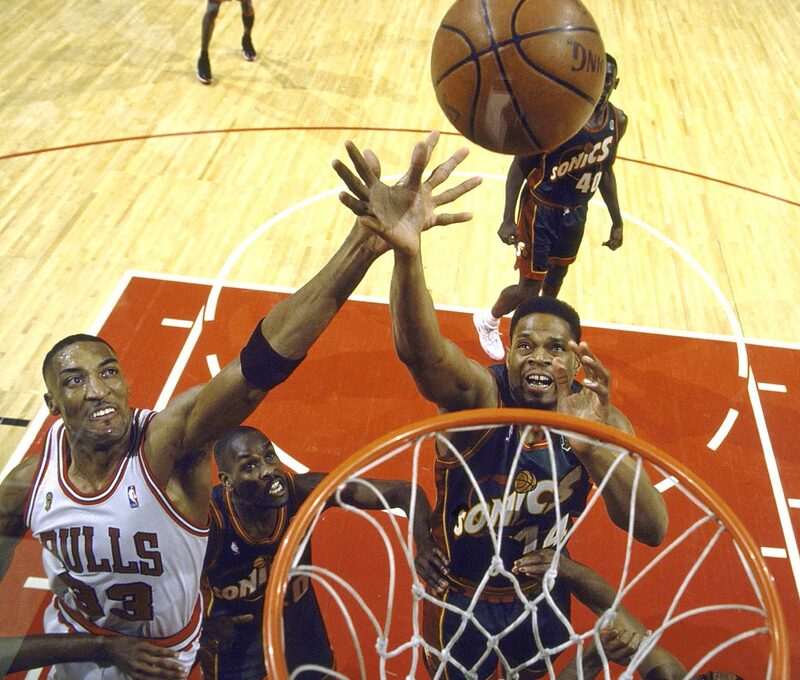 Scottie Pippen of the Bulls and Sam Perkins of the Sonics battle for a rebound. Pippen led Chicago in assists on the series, and the Bulls took their fourth championship, emboldened by Jordan's return from a two-year retirement. 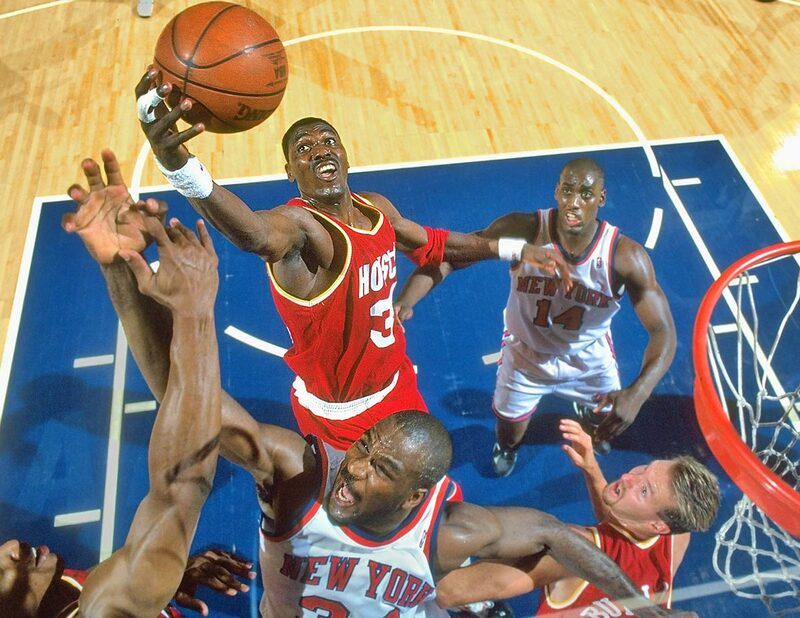 Hakeem Olajuwon averaged nearly 33 points on the series to bolster the Rockets to a second straight title in a four-game sweep. Clyde Drexler scored 25 points in a Game 3 win that all but sealed the series. Hakeem Olajuwon was named Finals MVP, averaging nearly 33 points for the series to bolster the Rockets to their first title, in a four-game sweep. 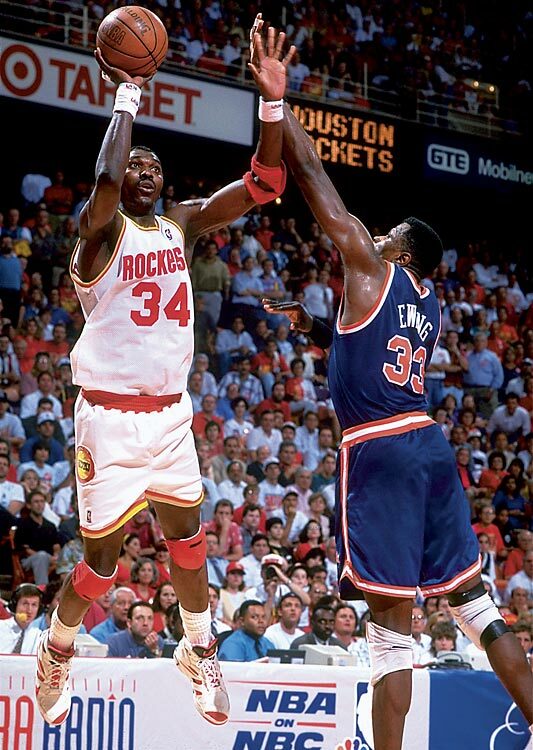 Star centers Hakeem Olajuwon of the Rockets and Patrick Ewing of the Knicks duked it out in 1994 in a series that went seven games. 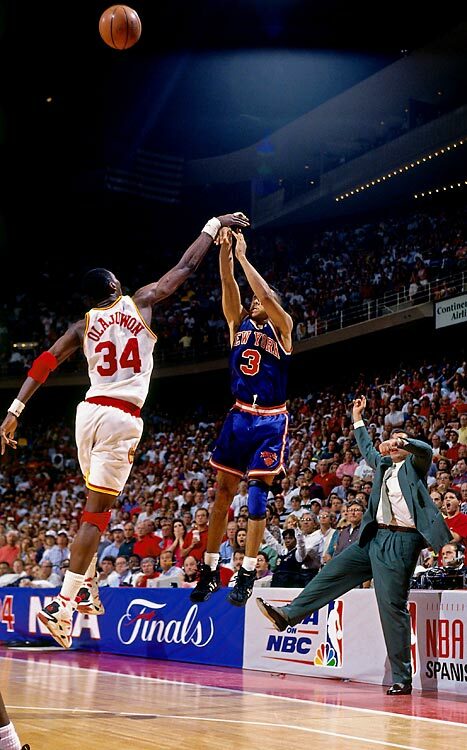 In Game 6, Olajuwon blocked a potential game-winning three by Knicks guard John Starks to secure the win and send the series to a final game. Michael Jordan battles Suns guard Kevin Johnson beneath the hoop. 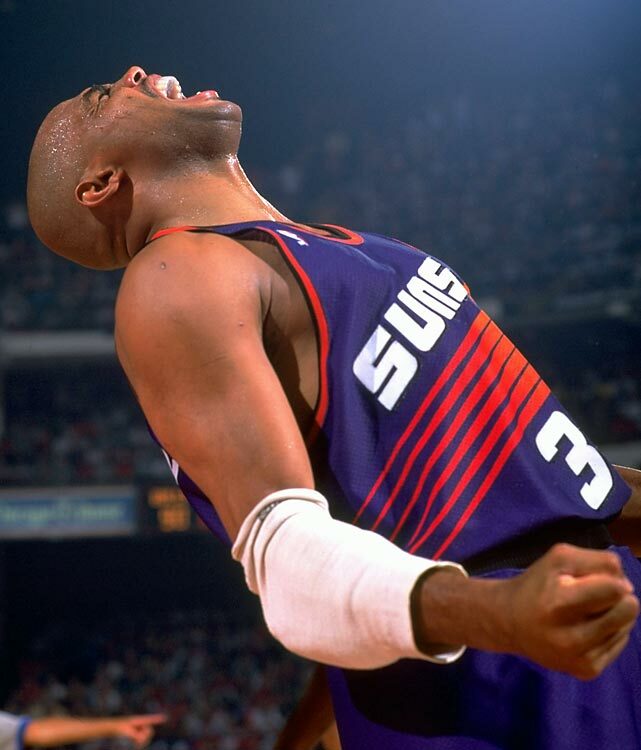 Suns star Charles Barkley celebrates Phoenix's Game 5 win. Though "Sir Charles" averaged 27.3 points and 13 rebounds, it wasn't enough to lift the Suns past Chicago. Years later, he would admit the series made him realize Jordan was the superior player. Scottie Pippen of the Bulls drives to the basket against the Suns. Pippen averaged 21.2 points, 9.2 rebounds and 7.7 assists in the series. 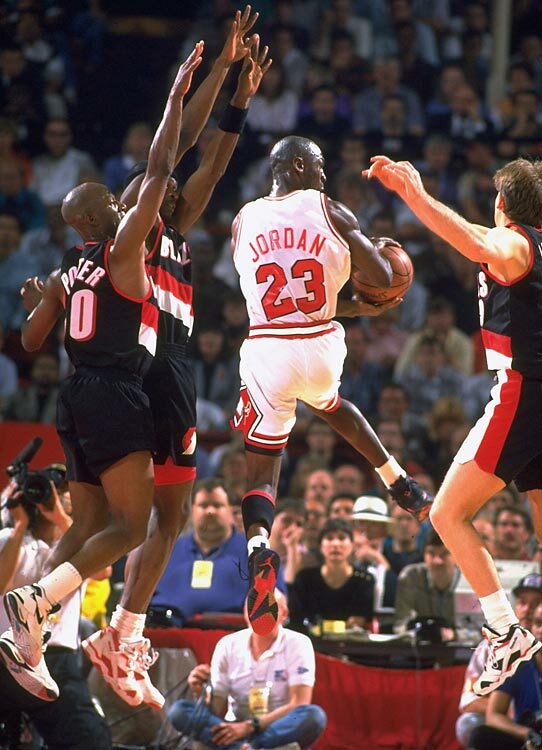 Michael Jordan and the Bulls appeared in their second Finals to face Clyde Drexler and the Portland Trail Blazers. The debate about who was better between MJ and Clyde was effectively silenced as Jordan hit six first-half threes in Game 1, famously shrugging at the broadcast table after hitting the sixth one. Jordan's dominance set the tone for the series. 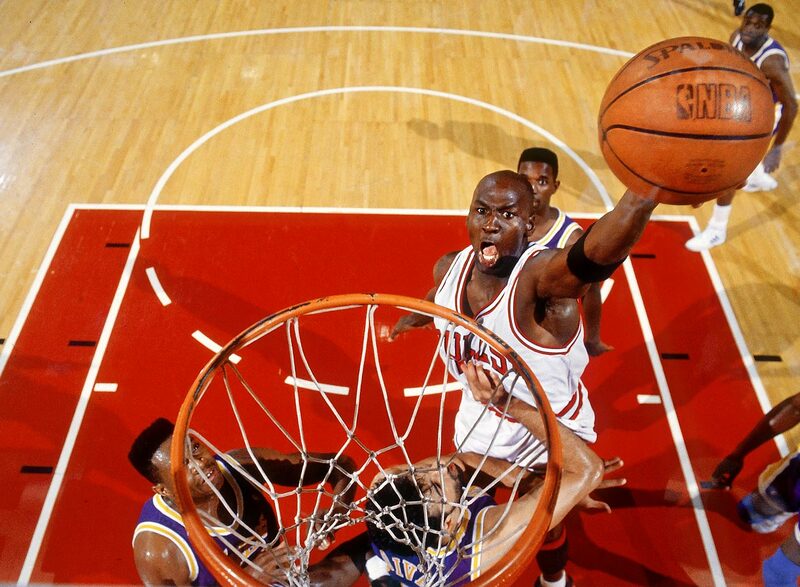 Michael Jordan skies for a dunk over Lakers center Vlade Divac in Game 2, a 107-86 Chicago win. Jordan scored 33 points on 15-of-18 shooting, including his famous hand-switching layup to lead the Bulls. 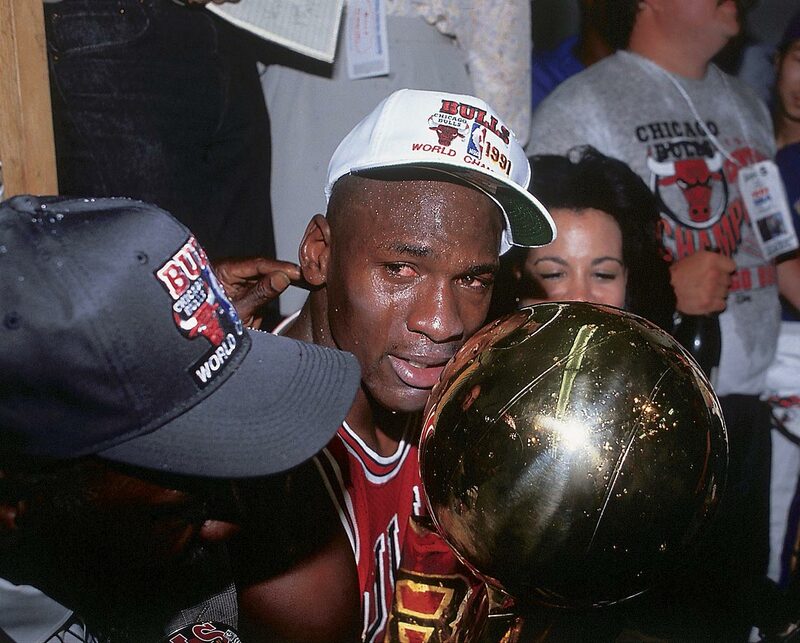 With his parents at his side, Michael Jordan holds the Chicago Bulls' first-ever championship trophy after defeating the Los Angeles Lakers in five games. 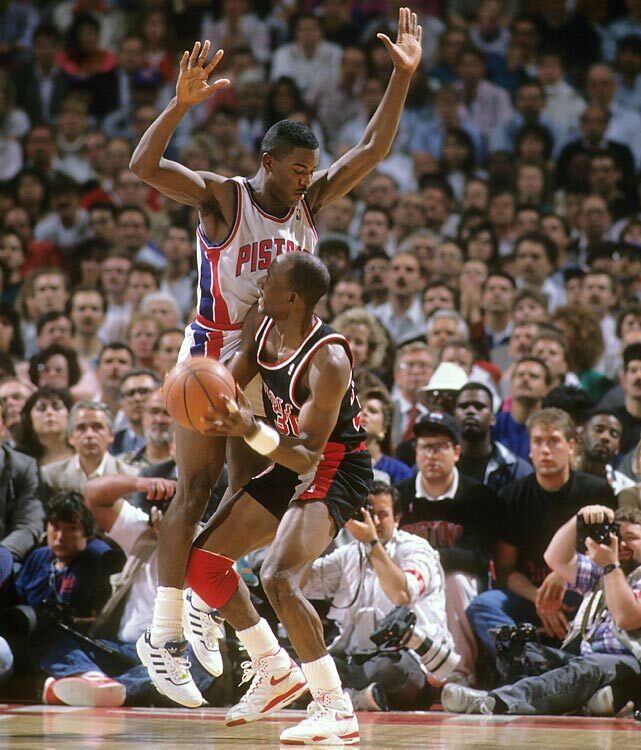 Joe Dumars of the Pistons defends Terry Porter of the Trail Blazers in Game 1. The backcourt of Isiah Thomas (27.6 points per game) and Dumars (20.6) propelled Detroit to the championship in five games. Vinnie Johnson hit the series-clinching jumper at the end of Game 5. 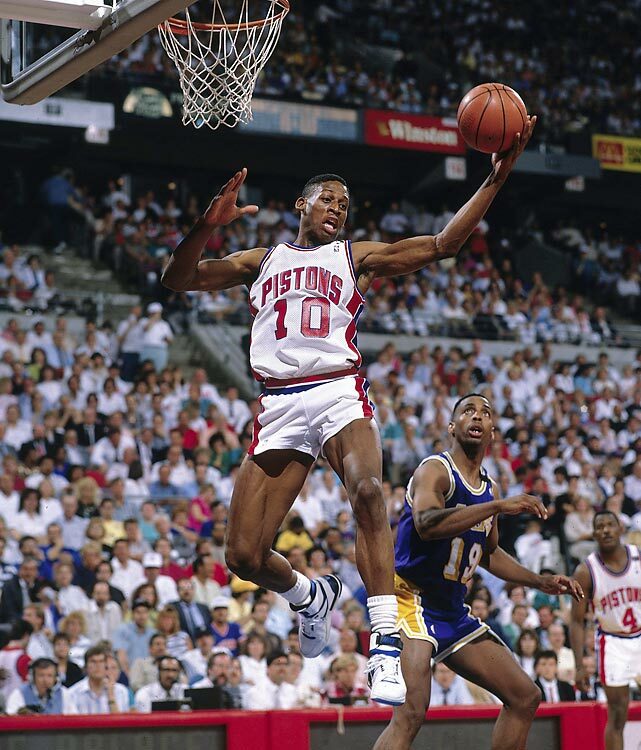 Pistons forward Dennis Rodman snatches a board against the Lakers. Detroit ended L.A.'s bid for a third straight title with a four-game sweep after Magic Johnson injured his hamstring early in Game 2. A new challenger emerged from the Eastern Conference as Detroit's "Bad Boys," starring point guard Isiah Thomas took on the Lakers. With Detroit up 3-2 going into Game 6, Thomas scored 25 gritty third-quarter points playing on a sprained ankle. 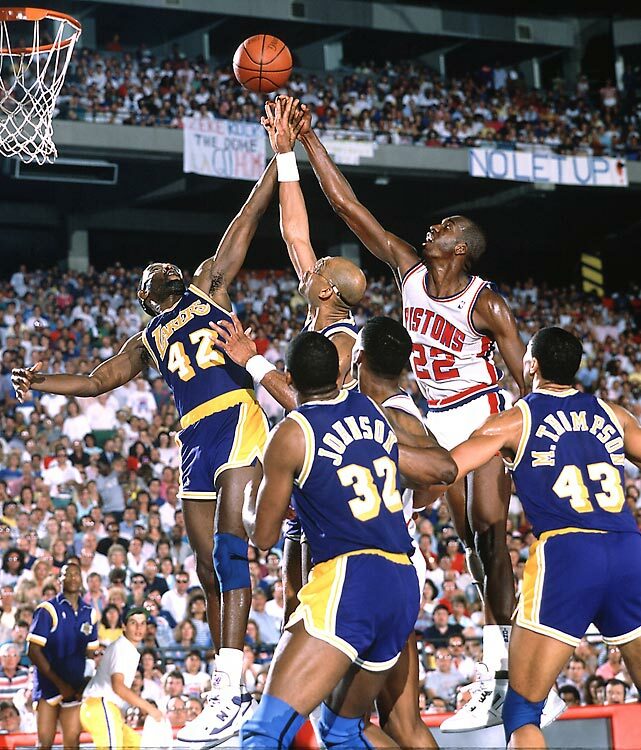 It wouldn't be enough — L.A. won Game 6 103-102, with 28 points from James Worthy. 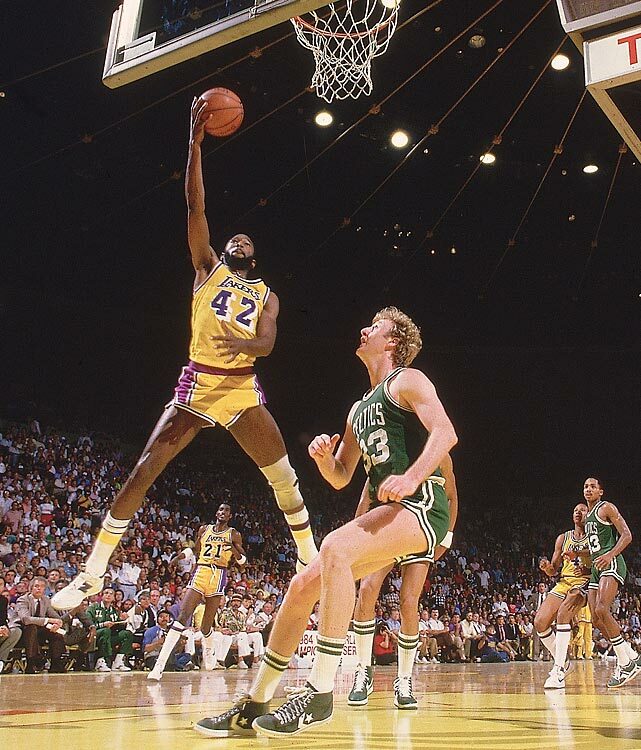 In Game 7 James Worthy (42) again shouldered the load for Los Angeles, recording a triple-double with 26 points, 16 rebounds and 10 assists to secure another Lakers title and Finals MVP accolades. 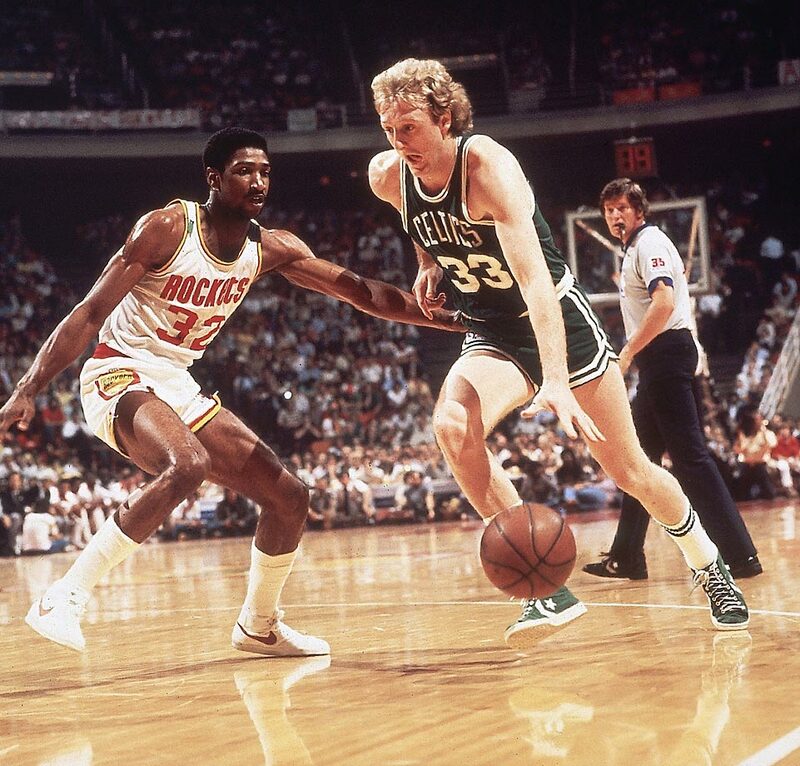 Boston, L.A., Bird and Johnson would meet in the Finals for the last time in 1987. Los Angeles won in six games with the core of Johnson, Abdul-Jabbar and Worthy again proving to be the cream of the crop. 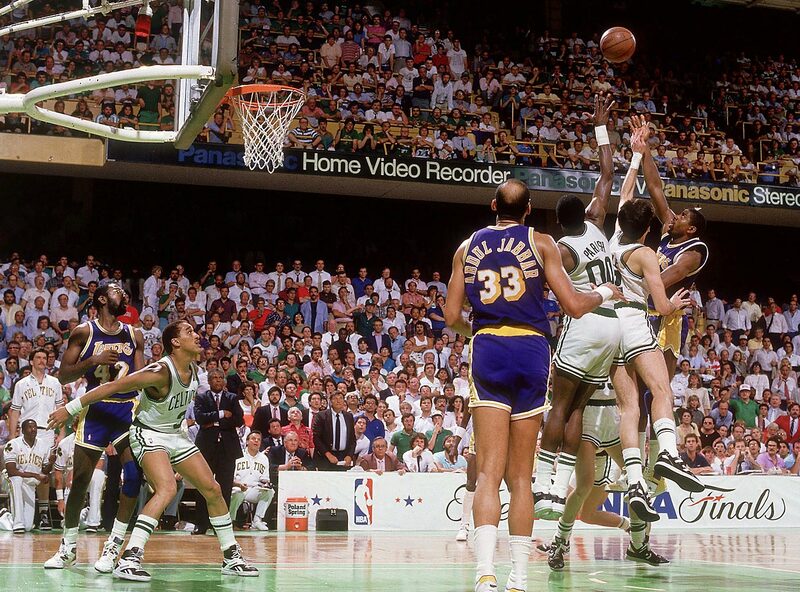 Magic Johnson drains his famous junior sky hook over Robert Parish and Kevin McHale to win Game 4 for the Lakers at the buzzer. Johnson was named Finals MVP. Larry Bird battles Hakeem Olajuwon under the hoop. The Celtics would win their second title in three straight finals appearances, paced by the dominant Bird (24 points, 9.7 rebounds and 9.5 assists per game), who posted a triple-double in the series-clinching Game 6. Rival stars Magic Johnson of the Lakers and Larry Bird of the Celtics battle beneath the rim in Game 1 of the 1985 Finals. L.A. pulled the series out in six games thanks to vintage play from 37-year-old Kareem Abdul Jabbar. 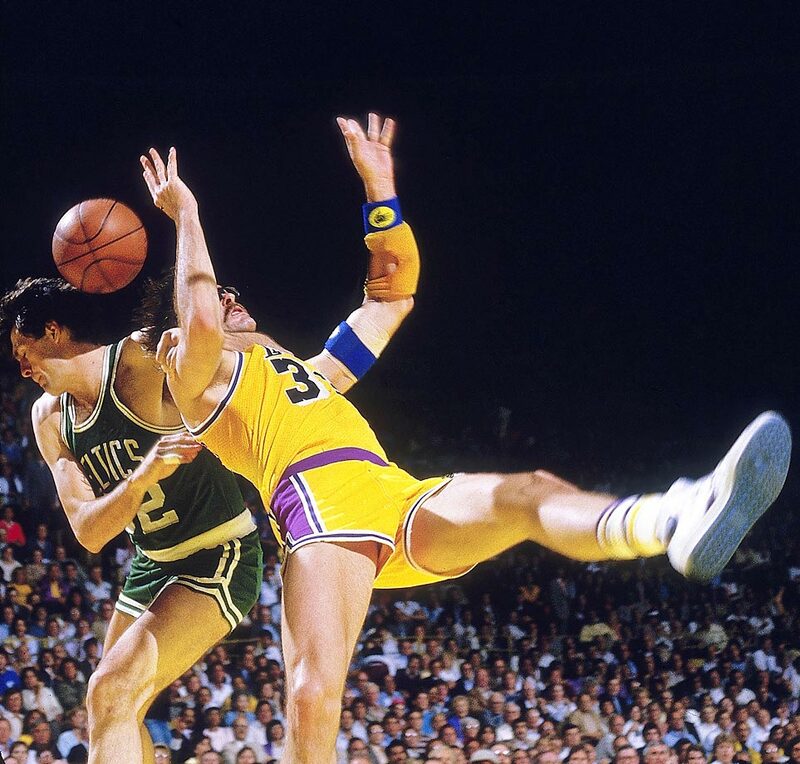 Kevin McHale of the Celtics delivers an extremely hard foul on Lakers forward Kurt Rambis in Game 4. The Boston-Los Angeles rivalry was reignited with an epic seven-game clash between the teams. 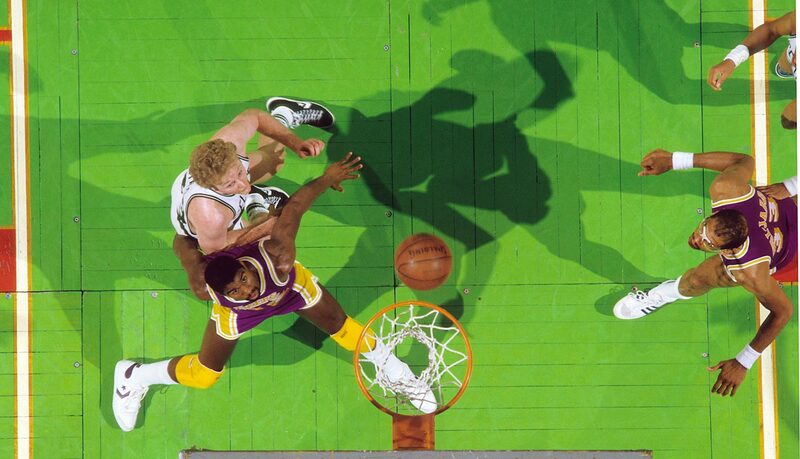 Los Angeles forward James Worthy rises to score over Boston's Larry Bird during a 119-108 Game 6 Lakers victory. Julius Irving of the Sixers soars to the rim in their third finals matchup with the Lakers in four seasons. This time Philadelphia would prevail in a four-game sweep. 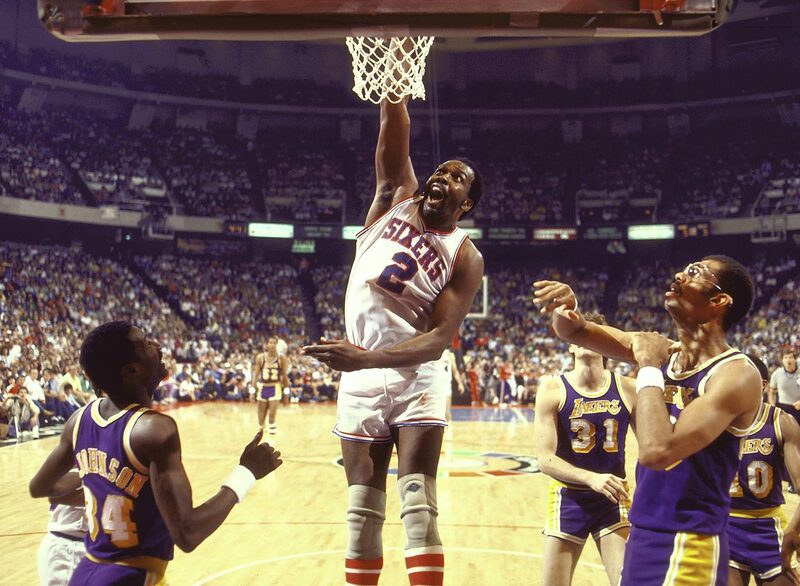 Finals MVP Moses Malone was dominant in Philadelphia's sweep of Los Angeles, averaging 25.8 points and 18 rebounds per game while outplaying L.A. center Kareem Abdul-Jabbar. 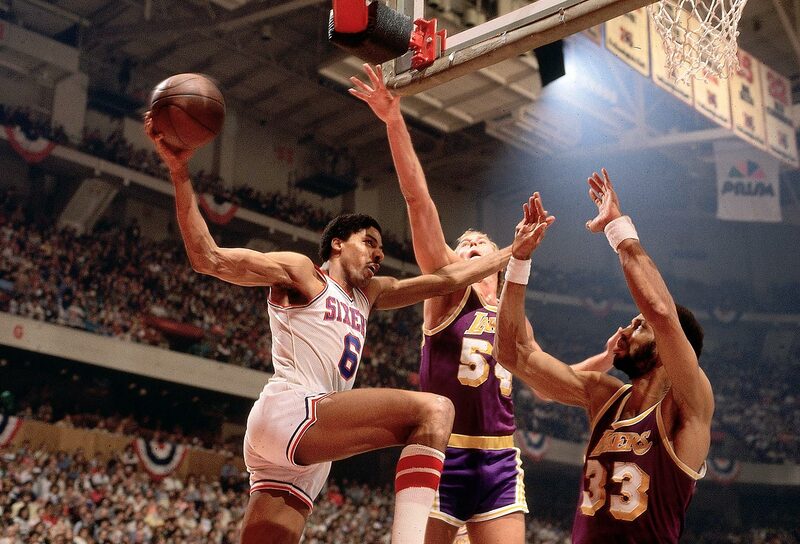 Kareem Abdul-Jabbar and the Lakers squared off against Julius Erving and the Sixers in a rematch of the 1980 finals. The Lakers once again prevailed in six games. 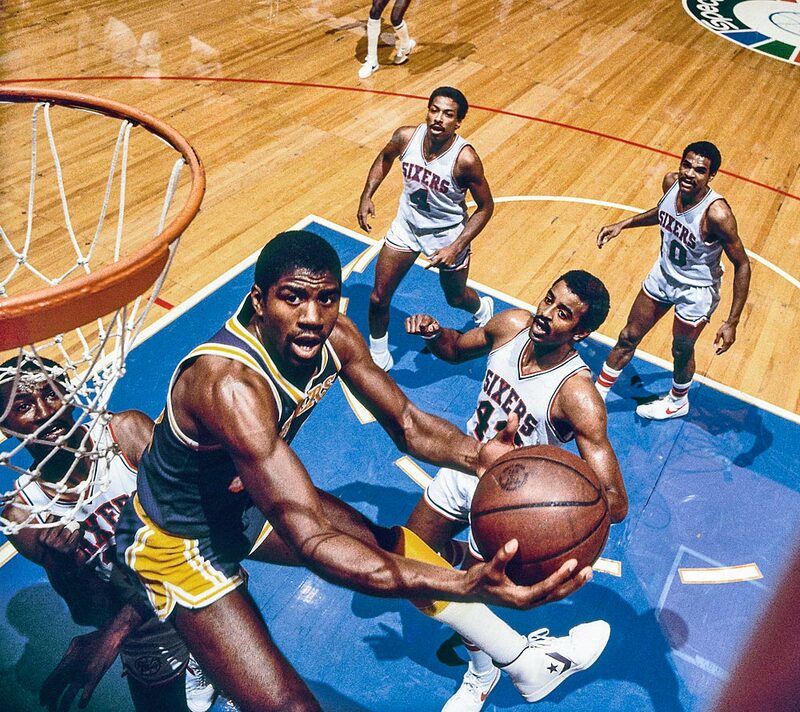 Magic Johnson attacks the hoop against the Sixers. Johnson fell just short of averaging a triple-double in the six-game series, with 16.2 points, 10.8 rebounds and 8 assists per game and winning MVP honors. In 1981 it was Larry Bird's Celtics establishing themselves against the Rockets and dominant center Moses Malone. Moses Malone averaged 22.2 points and 16.3 rebounds for the series, which the Celtics won. 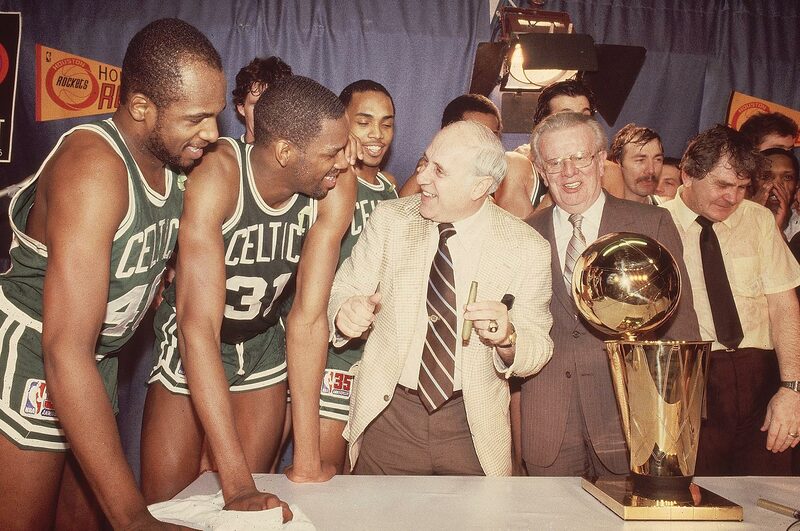 Boston Celtics owner Red Auerbach celebrates with the trophy and his team after beating the Houston Rockets in six games behind Finals MVP Cedric Maxwell and star Larry Bird. Julius Erving soars and stretches for what would become an iconic reverse layup in Game 4. The Sixers tied the series with a 105-102 win at home. Philadelphia's Darryl Dawkins battles Los Angeles Lakers defenders on his way to the rim. "Chocolate Thunder" led the Sixers in scoring in their only two wins of the series. 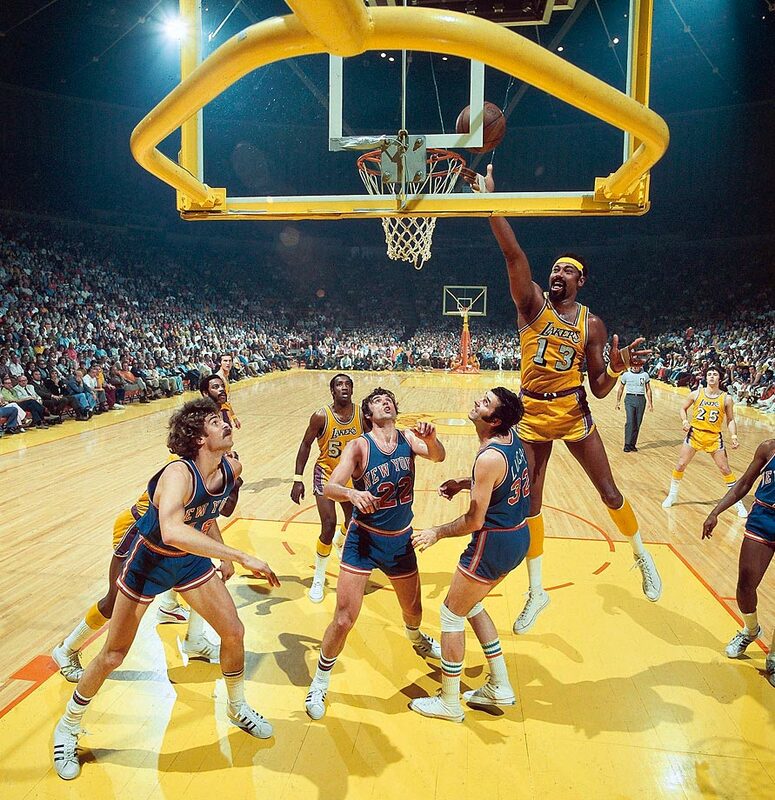 Kareem Abdul-Jabbar dunks against Julius Erving in Game 5 between the Lakers and Sixers. Magic Johnson's 42 points, 15 rebounds and 7 assists in Game 6 sealed the series for the Lakers, sparking a 123-107 win. The versatile Johnson memorably started the game at center for the injured Kareem Abdul-Jabbar in one of the greatest games in playoff history. 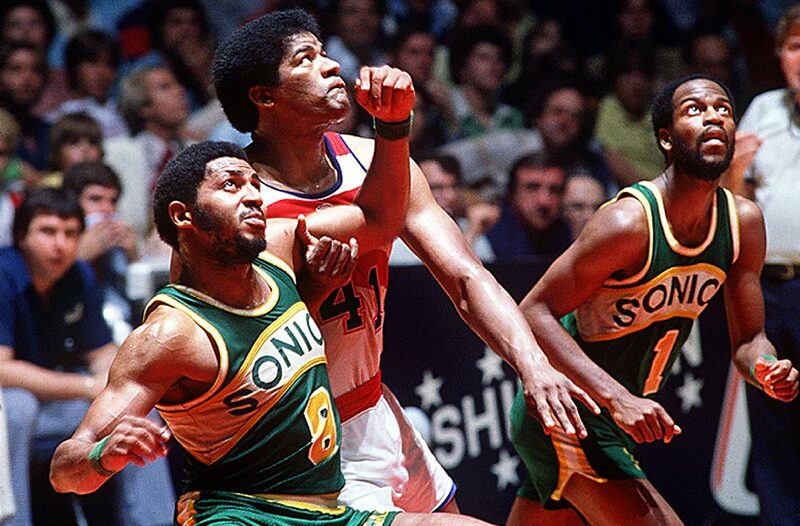 Lonnie Shelton of the Sonics battles Wes Unseld of the Bullets during the 1979 Finals. Unseld led Washington to a title over Seattle the previous year, but the Sonics stuck this one out behind their high-scoring backcourt of Gus Williams and Dennis Johnson. 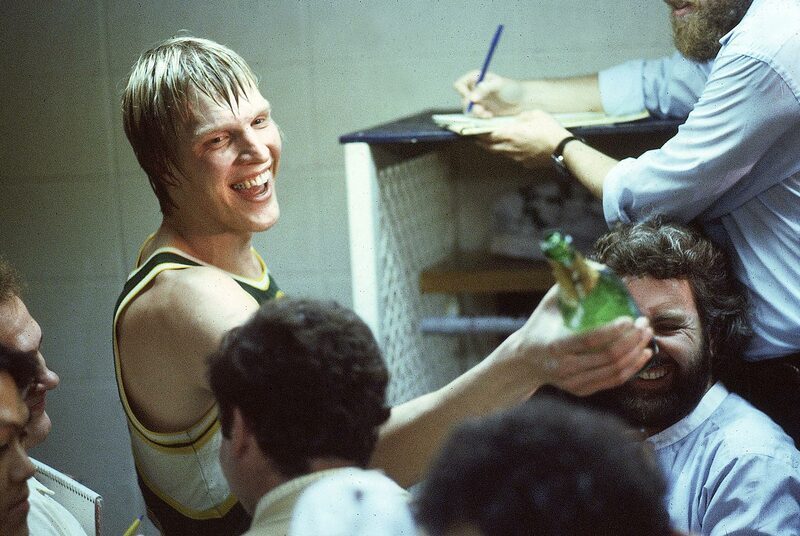 Jack Sikma of the Supersonics celebrates after the series-winning Game 5 against the Washington Bullets. It would be Seattle's lone championship in franchise history. Elvin Hayes of the Washington Bullets watches the ball on the rim. Averaging 20.7 points and 11.9 rebounds, Hayes led Washington to its only title in franchise history. Julius Erving soars to the basket for a dunk in Game 2 between the 76ers and Trail Blazers. 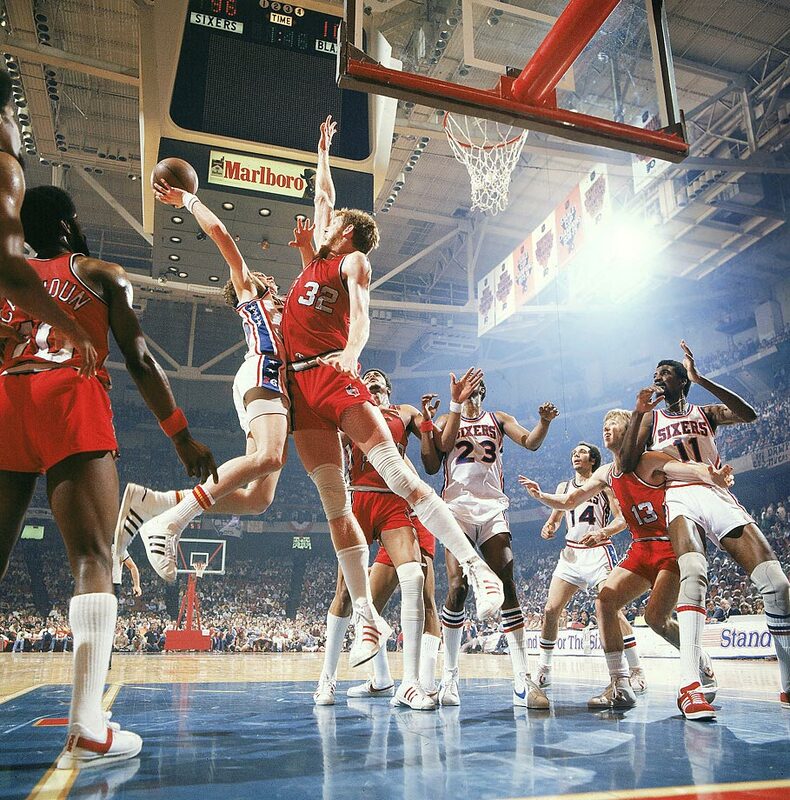 Bill Walton of the Trail Blazers contests a shot by Doug Collins of the 76ers. Walton galvanized the Blazers, who won the series in six games behind his Finals MVP-winning 18.5 points and 19.0 rebounds per game. Gar Heard of the Suns releases the game-tying shot at the double-overtime buzzer against the Boston Celtics in Game 5. Boston prevailed 128-126 in the third OT, and took the series in six. 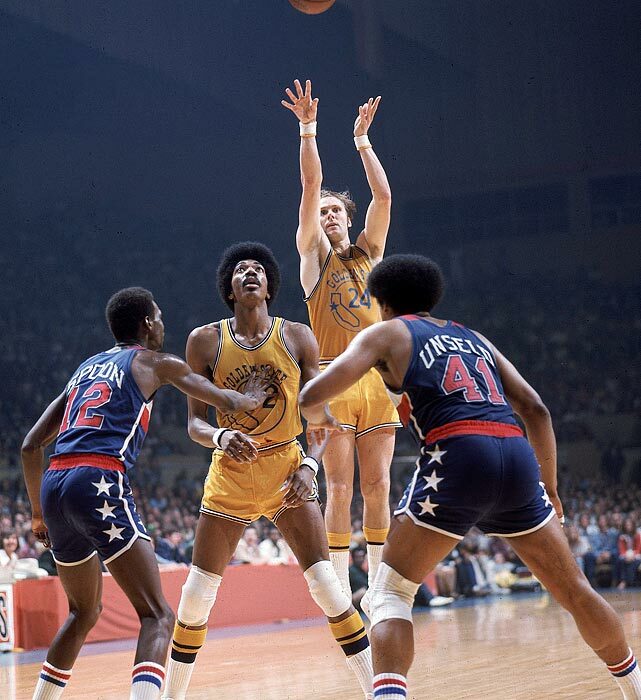 The underdog Warriors were bolstered by a red-hot Rick Barry, who led the team in a 4-0 sweep of the Bullets. Barry averaged 29.5 points, 5 assists, 4 rebounds and 3.5 steals in the series. 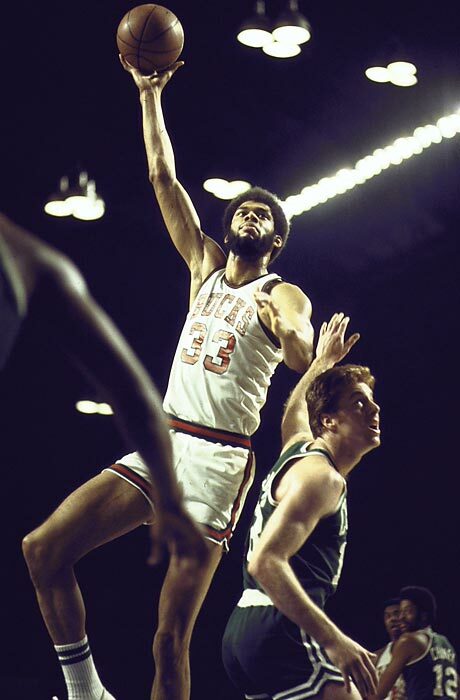 Kareem Abdul-Jabbar paced the Bucks, averaging 32.6 points per game and deploying his signature sky hook to seal Game 6, but the Celtics would pull it out in a seventh game. 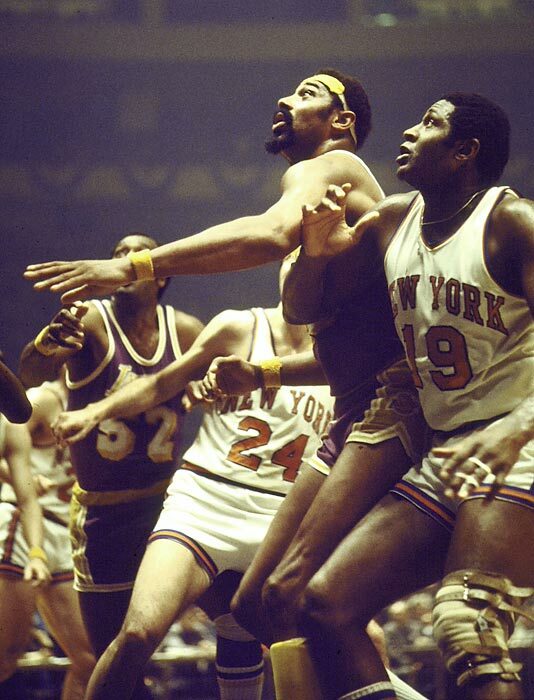 The Lakers and Knicks clashed in a rematch of the previous year, but this time it was New York in five, and Knicks center Willis Reed (19), not L.A.'s Wilt Chamberlain (center), named MVP (16.4 points, 9.6 rebounds). 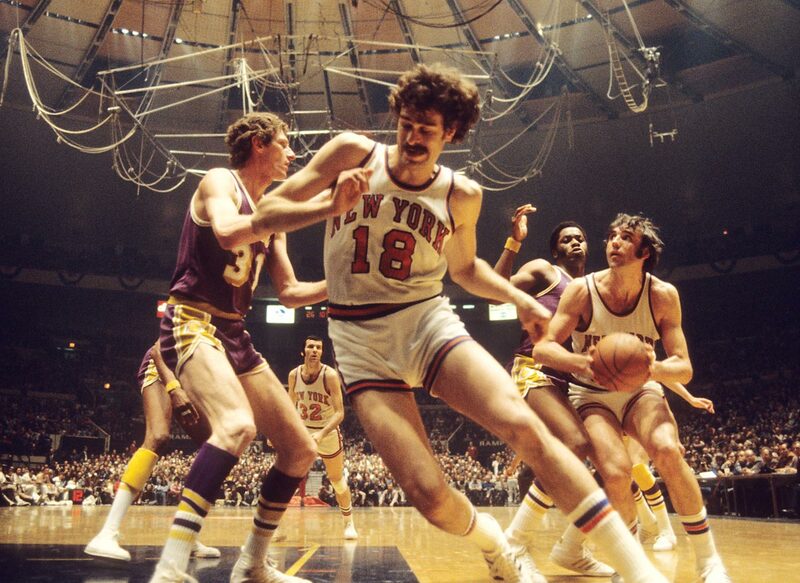 Knicks Dave DeBusschere (with ball) and Phil Jackson (18) in action against Lakers Jim McMillian and Mel Counts (31) during Game 3. The Knicks would win 87-83. 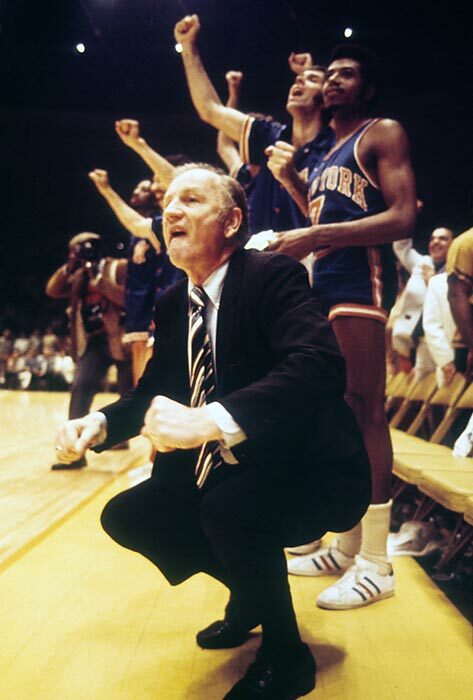 New York Knicks coach Red Holzman celebrates on the sidelines during Game 5. Earl Monroe scored 23 points for the Knicks in the series-clincher. Lakers center Wilt Chamberlain took home Finals MVP honors as the Lakers defeated the Knicks in five games and won their first title since moving to Los Angeles. Chamberlain averaged 19.4 points and 23.2 rebounds on the series. 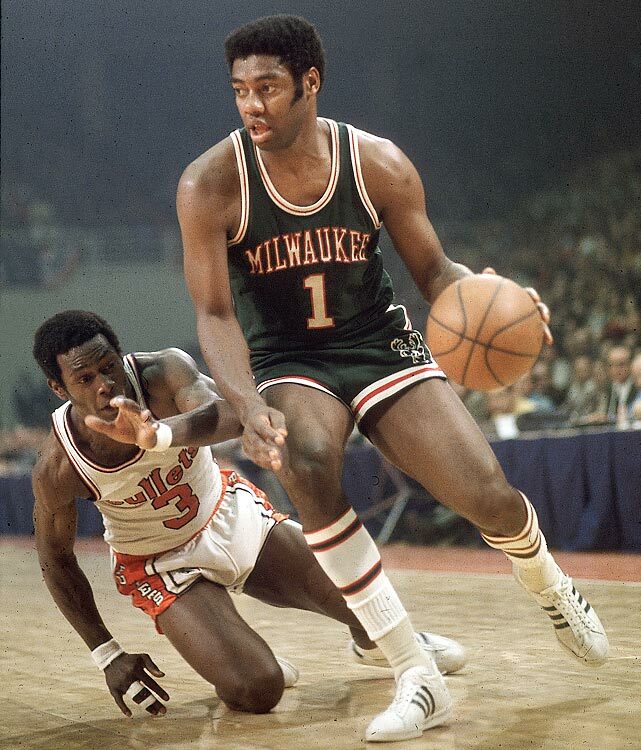 Oscar Robertson led Milwaukee on a 4-0 sweep of Baltimore in his first season joining up with Lew Alcindor and the Bucks. Robertson had 30 points in the series-clincher. 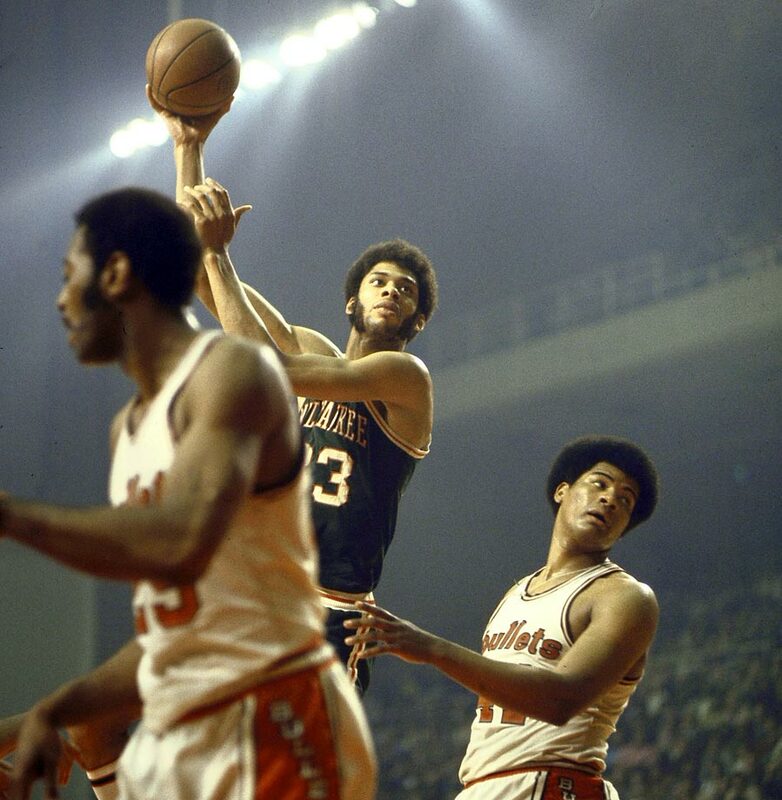 Lew Alcindor lofts one of his signature hook shots. Alcindor won the Finals MVP award, averaging 27 points and 18.5 rebounds in the four-game Milwaukee sweep. 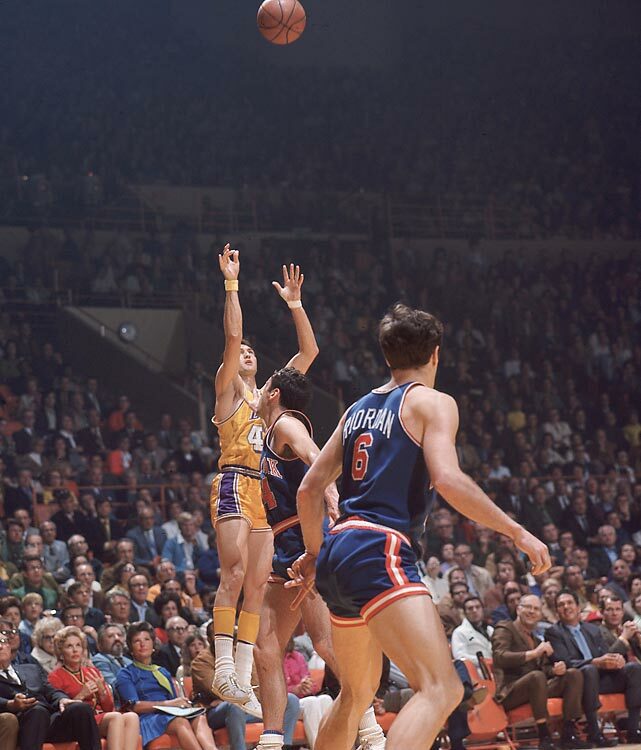 Jerry West of the Lakers launches a shot against the Knicks. West drained a dramatic, desperation 63-footer as time expired in Game 3 to send things to overtime. The Lakers went on to lose that game and dropped the series to New York, 4-3. 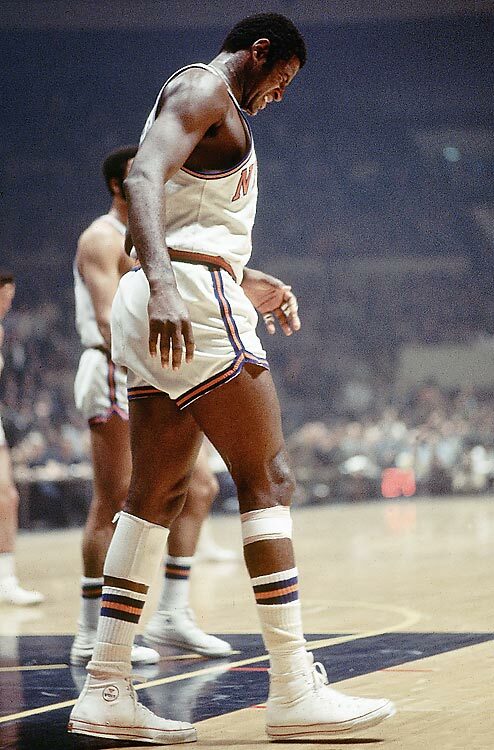 In Game 7 of the 1970 finals, injured Knicks center Willis Reed made a dramatic surprise entrance, scoring the first two baskets of the game in front of a packed Madison Square Garden crowd. 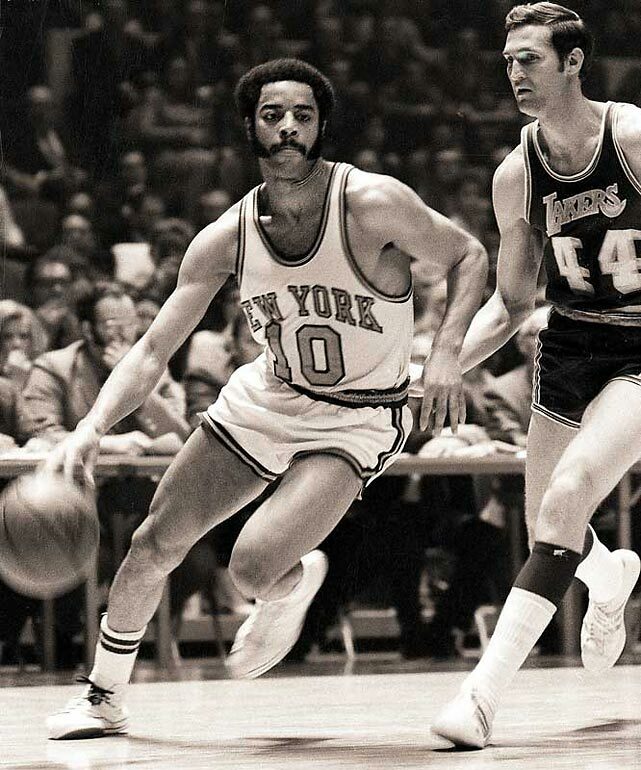 Reed got the crowd excited, but it was Walt "Clyde" Frazier, whose 36 points and 19 assists propelled the Knicks past the Lakers 113-99 to win the championship. 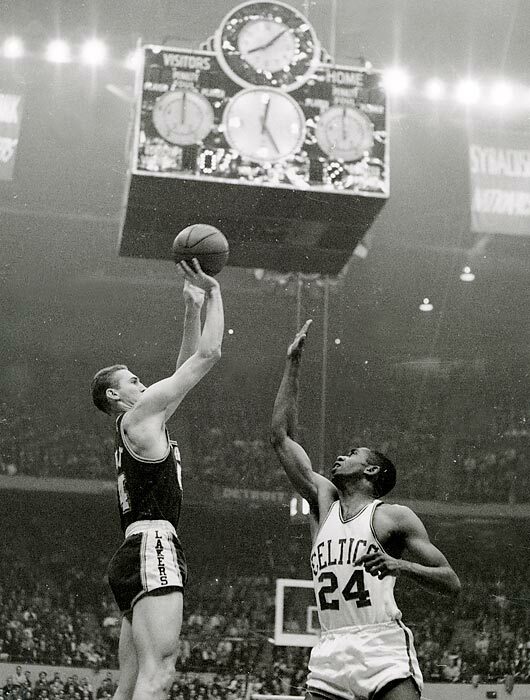 Bill Russell attempts to block Jerry West in Game 3 between the Celtics and Lakers. The Lakers were heavily favored (West averaged 38 points in the series on a squad that also had Wilt Chamberlain) and jumped out to an early 2-0 lead, but the Celtics came back to hand player-coach Bill Russell his final championship. Sam Jones of the Celtics dribbles around Jerry West of the Lakers. 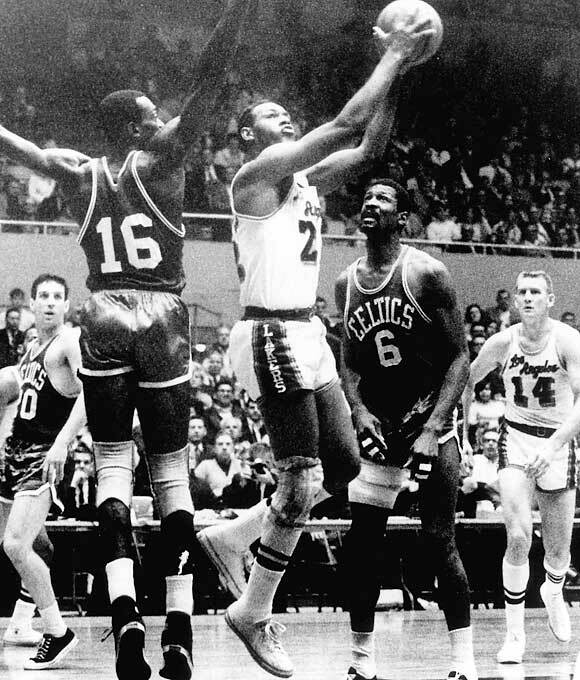 Jones would hit the game-winner in Game 4 of the 1969 finals to even the series at two games. Boston would go on to take the title in seven. 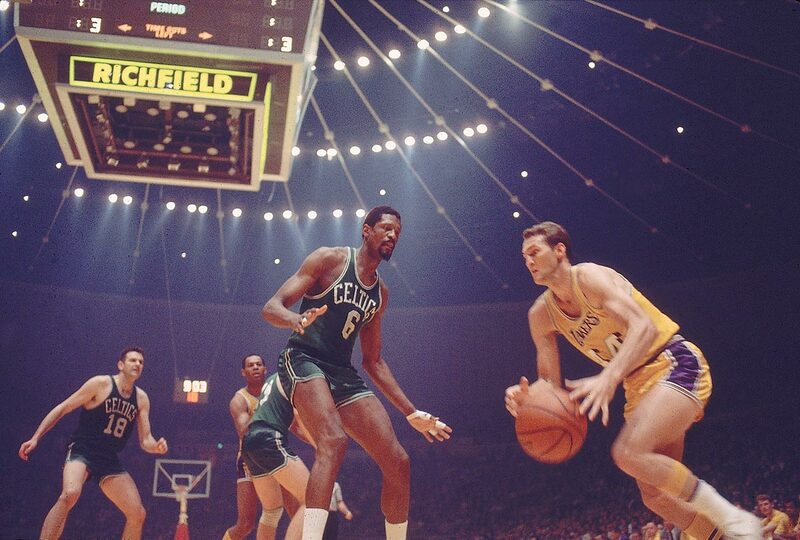 Lakers guard Jerry West drives past Celtics center Bill Russell in Game 6. Boston went on to a 124-109 win at the Forum to clinch the series 4-2. Bill Russell leaps to block Elgin Baylor. Russell and the Celtics were a constant thorn in the Lakers side, defeating them for five of their eight straight titles (1959-66). 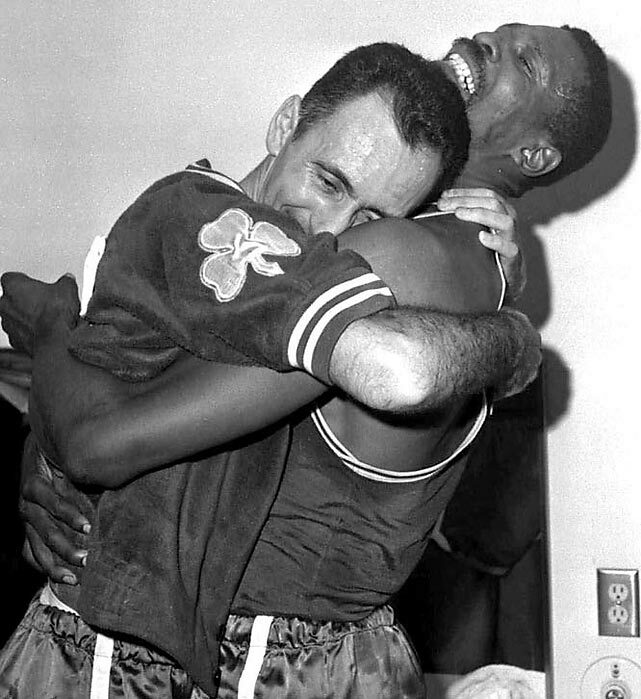 Bill Russell holds a corsage sent to the dressing room as he celebrates with Celtics coach Red Auerbach after defeating the Lakers, 95-93, in Game 7 to win their eighth-straight NBA championship. Jerry West of the Lakers elevates for a jumper in Game 7 against the Celtics. West scored 35 points, but Boston would win the game and the series. 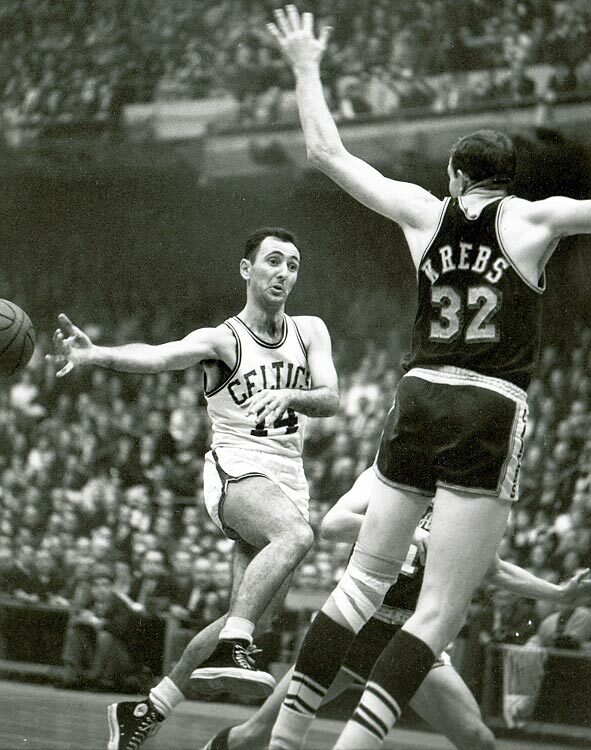 Celtics point guard Bob Cousy (14) throws a no-look pass in Game 7. Later that game, he would famously elude several Lakers and dribble out the clock to deliver Boston the title. In one of the greatest winner-take-all games in NBA history, the Celtics beat the Lakers for the title, 110-107 in overtime, behind Bill Russell's 30 points and 40 rebounds. 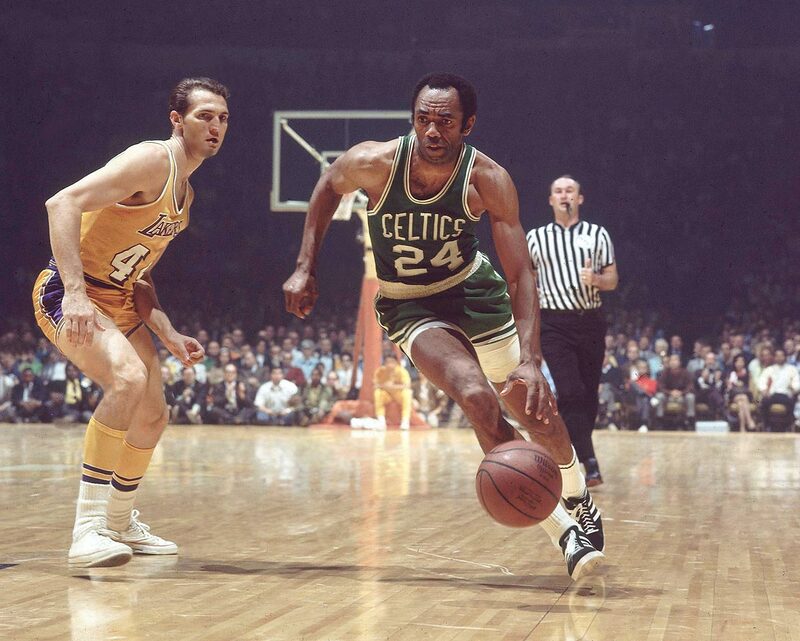 Elgin Baylor of the Lakers erupted for a Finals-record 61 points and grabbed 22 boards against the Celtics in a 126-121 Game 5 win at Boston Garden. The Lakers took a 3-2 series lead in what became a classic first finals meeting between L.A. and Boston. 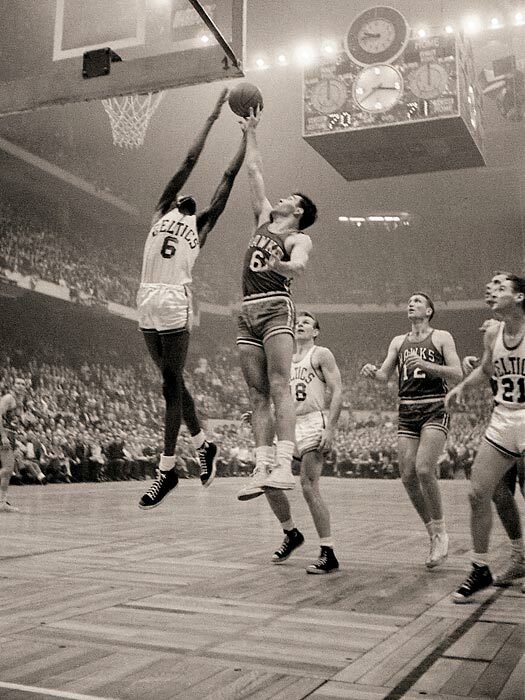 Bill Russell of the Celtics grabs a rebound over Cliff Hagan of the Hawks in Game 5 of the 1957 finals. The Celtics won the game 124-109 and took the series in seven in Russell's rookie year after acquiring his rights in a trade with ... St. Louis. 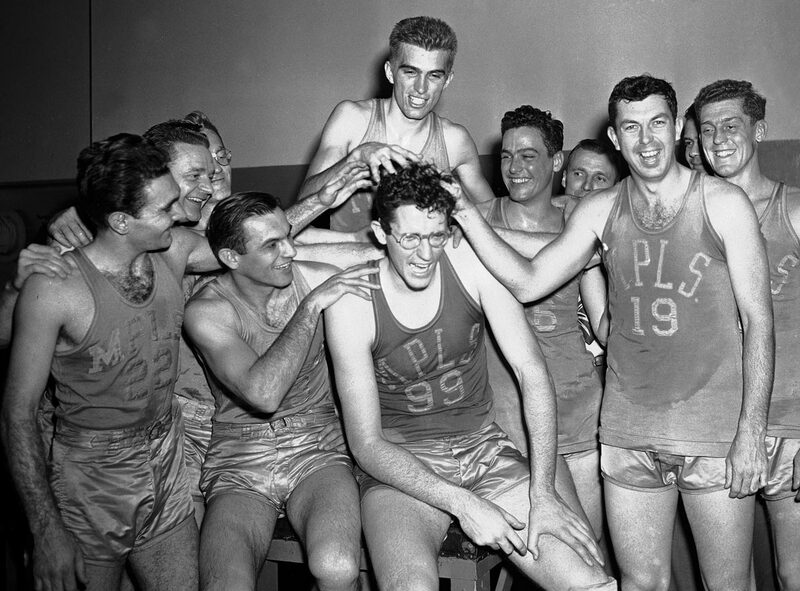 Lakers center George Mikan (99) gets his hair mussed by teammates after leading Minneapolis to its first-ever championship. Mikan set a Madison Square Garden scoring record with 48 points in a 101-74 victory over the Knickerbockers. The Lakers' 101 points also set an all-time team high scoring mark at the Garden. The Warriors took their lumps like the champions they are, refusing to use Green’s absence as an excuse. Curry, who scored 25 points, offered a “tip of the hat” to his Cleveland counterparts, while Thompson, who led Golden State with 37 points, said Irving was “great tonight and had my number.” The Splash Brothers, of course, know better than anyone how difficult it is to overcome not one but two scoring outbursts. They also know Green will be back in Game 6, restoring order, structure and effective communication to Golden State’s defense. Golden State is in the same spot in the series, yes, but Monday made it clear that there’s one obvious difference for Cleveland this time around: James finally has help, fearless help, A-list help, help that shows up when elimination is on the horizon.